Sign up for Athletics Ireland Summer Camps. See details here. NCAA Outdoor Results for April 2019. See here. Our thanks to Brother John Dooley for the information. Job Opportunity with Athletics Ireland - Competitions Department Executive. See details here. Tonosa & Mullen win Great Ireland 10km Run & National titles. See AAI Review & results here. Ennis Track A.C. Open Sports, Sunday 28th April @ 12 noon in Lee's Road, Ennis. See Programme of events here. Get Ireland Running. The great athletics 10,000 euro giveaway. See details here. AAI Spring Throws, Sunday 7th April in Athlone. See Results here. Results from Irish Universities T&F Championships here. Pictures from Kevin Clancy here (5 albums). Results from Day 3 of National Juvenile Indoor Championships here. Sportsfile photos here. Results of Ulster Throws Festival 2019. See here. Daily Mile nominated for Best Programme or Campaign to increase participation. See more here. Day 3 of National Juvenile Indoor Championships. See Entry lists and timetable here. See AAI Preview here. Please leave plenty of time to park in Athlone as Day 3 of the Juvenile Indoors and Day 2 of the Irish University T&F Championships are both in Athlone tomorrow. Please note that the Gary Castle entrance gate will be closed from 8am to 9.30am on Saturday 6th April. All entry will be through the main gate during these times. All Athletics Ireland National competition events will now be cashless events. This means they will accept visa debit and contactless payment for general admission. The AAI National Spring Throws take place on Sunday 7th April in AIT. The entry list is now available to view here. For any queries, please e-mail competition@athleticsireland.ie. All Athletics Ireland National competition events will now be cashless events. This means they will accept visa debit and contactless payment for general admission. The selection policy has been released for the European Combined Events Team Championships which take place from 6-7 July in Ribeira Brava, Portugal. Selection policy can be found here. NCAA Outdoor Track Results March 2019 - See here. Our thanks to Brother John Dooley for the information. Leevale A.C. Open T&F Meets, Saturday 27th & Sunday 28th April in Cork I.T. See all the details here. Marian A.C. Matt O'Connor Memorial Open Sports, Sunday 7th April in John O'Sullivan Park, Ennis (Lee's Road) @ 11am. See details here. Gneeveguilla A.C. Open Juvenile Sports, Sunday 7th April in An Riocht A.C. Track, Castleisland, Co. Kerry @ 1pm sharp. See all the details here. Juvenile's deliver more excitement on Day 2. See AAI Review from Day 2 of National Juvenile Indoor Championships here. World M65 1500m Indoor title for Joe Gough, West Waterford A.C. at World Indoor Championships in Torun, Poland on Saturday 30th March. It's his 7th World Masters title which he won in 4.51.39. Joe played a patient game running in second position almost throughout while running in a group of 5, then 4. Joe made a decisive move just after the bell and went on to win emphatically. Congrats to Joe on his double World gold medal victory. 62nd for Sean Tobin, Clonmel A.C. in Senior Men's race and 53rd for Darragh McElhinney, Bantry A.C. in Junior Men's race at World Cross Country. See AAI Review and results here. Juvenile Ace Athlone Indoors on Day 1. See AAI Review and results here. Sportsfile pictures here. World Cross Country Championships, Saturday 30th March in Aarhus, Denmark. See AAI Preview here. Good luck to Munster athletes, Sean Tobin, Clonmel A.C. (Senior Men) & Darragh McElhinney, Bantry A.C. (Junior Men). Livestream Link here. Action also on the BBC red button. Timetable here. A piece of history, John Treacy wins world title in Limerick in 1979. See here. Congrats to Joe Gough, West Waterford A.C. who was crowned World Champion in the 800m for the 6th time, this time winning the M65 title. See photos and info here. Well done also to Annette Quaid, Leevale A.C. who was 2nd in the W40 800m despite suffering a heavy fall. See race here. To potential 2019 EYOF Team Members. See important information here. Irish Life Health National Juvenile Indoor Championships. See Start Lists, timetables and other information here. SIAB Schools XC International, Saturday 23rd March in Santry. See Results here. See AAI Preview here. 2019 European Youth Olympic Festival, Baku, Azerbaijan, 21st to 27th July. See selection policy and standards here. Final session of Munster Development & Performance Squads takes place on Saturday 23rd March in Templemore Track. Development Squad from 11am to 1pm, 5 euro per athlete. Events covered will be Short Hurdles (Lilly-Ann O'Hora), Shot Putt (Dave Fratarolli), Long Jump (Pat Power), Pole Vault (Eamon Flanagan) & Walks (Frank Lynch). There will be no Middle Distance. Both the Development & Performance Walks will take place TOGETHER at 1pm. Performance Squad from 1pm to 3pm, all events will be covered. Discus coach, Sean Whitney will be available from 11am to 3pm. St. Senan's A.C. Open T&F Meet, Easter Monday, 22nd April in the Sports Complex, Kilmacow, Co. Kilkenny. See more here. Ton Le Gaoithe Wind Sprints Meet. See details here. Online entry now open here. Great Ireland Run incorporating the Natioanl 10km Championships, Sunday 14th April in the Phoenix Park, Dublin. See all the details here. Darragh McElhinney, Bantry A.C. (U/20) & Sean Tobin, Clonmel A.C. (Senior Men) selected for World Cross Country Championships in Aarhus, Denmark on Saturday 30th March. See details here. AAI Month End Registrations for February 2019. See here. Online Entry now open for National Spring Throws, Sunday 7th April in Athlone. Closing date is Wednesday 3rd April. See details here. Ciara Mageean, Irish Times Sport Ireland Sportswoman Award for February. See more here. REMINDER: Online entry closes tomorrow (Thurs 14th) at midnight for Munster Qualifiers to National and also OPEN entries for U17 to U19. Final list will be circulated to Clubs over the weekend to check for any errors. Munster Half Marathon & Marathon Championships, Sunday 5th May in Limerick. See all the details here. IAAF Council approves Olympic Qualification System and Entry Standards. Read more here. Age no barrier in Athlone. See AAI Review of Irish Life Health National Masters Indoor Championships here. Irish Life Health Irish Schools XC Championships - See AAI Review and results here. Tralee Harriers A.C. Best Practices. See Article here. Seven Athletes to compete at the European Throwing Cup. See AAI Preview here. Online entry is now open for Clubs to enter their Munster qualifiers for National Juvenile Indoor Championships. Closing date is 8pm on Thursday 14th March. Use this link to complete entries - https://ireland.entry4sports.com/wp-login. An e-mail with all the instructions has gone around to all Clubs. A list of qualifiers will be posted here shortly. Many thanks to all the schools who supported the event, to Nenagh Olympic A.C. and to all who helped out on the day. Photo link here. Our thanks to Kevin Clancy, Photographer. Irish Life Health Irish Schools Cross Country Championships, Saturday 9th March in Clongowes Wood College, Clane, Co. Kildare. See Munster qualifiers here. Timetable and Course Map here. See AAI Preview here. Irish Life Health Master Indoor Championships, Sunday 10th March in AIT. See Timetable here. See Start Lists here. AAI Preview here. Run, Jump, Throws Workshop held in Limerick. See AAI Report here. NCAA Conference Results, February 2019. See Results here. Our thanks to Brother John Dooley for all the info. See additional information on Munster athletes in the US here. Date Changes for Munster Outdoor Season - Fixtures on Saturday 25th May and Saturday 8th June will be swapped so the 25th will now be Munster U/9 to U/11 Individual & Team Games, Men's & Women's Walks, Women's 3km races & Senior, M35 - M45 5km races in Cork I.T. and Day 1 of Munster U/12 to U/19 T&F Championships will be on 8th June in Templemore. Munster Juvenile "B" T&F venue will be Lee's Road, Ennis, Co. Clare. See Motions and Recommendations passed at the recent Munster Convention here. "A Tribute to our two European Bronze Medalists" by Fintan Walsh, Waterford Athletics PRO. See here. See photos here from Munster 4 Mile Road Championships in Dundrum, Co. Tipperary. Our thanks to Niall Moran, photographer. Thanks also to Dundrum A.C. for hosting this event, they did a super job. CHANGE OF VENUE FOR MUNSTER AGM: The Munster AGM will now take place in the Woodstock Hotel, Ennis on Saturday 2nd March. Start time is still the same, 11am. To get to the Woodstock Hotel, take Exit 12 from the Motorway, carry on straight through 4 roundabouts. At the 5th roundabout, turn left for Ennistymon, then take the first left for the Woodstock Hotel. The hotel is about 1 mile up this road on the left and the meeting is being held in the Doonbeg Suite. Munster Juvenile PRO Report for 2018. See here. European Indoor Championships - coverage on RTE 2 from 6.30pm on Friday 1st March. Good luck to the team and our Munster athletes, Ciara Neville, Emerald A.C. (60m), Phil Healy, Bandon A.C. (400m), Thomas Barr, Ferrybank A.C. (400m) & Sean Tobin, Clonmel A.C. (3000m). Athletics Ireland and Waterways Ireland launch strategic partnership. See details here. Sprint Relay Workshop, Sunday 7th April in AIT. More details here. 2019 Throwing Cup Selections. See here. Online entry open for National Masters Indoors. Closing date is Sunday 3rd March. See all the details here. Timetable here. Ferrybank A.C. Open Sports, Sunday 7th April in Waterford RSC @ 12 noon. See Flyer here. A big congratulations to Joe Gough, West Waterford A.C. who will be receiving an award from the World Masters Athletics Federationfor Male WINNER for the WMA Best Masters Athletes Awards 2018, in the category MIDDLE DISTANCE. See more here. Irish Times article here. Munster 4 Mile Road Championships will take place on Sunday 3rd March in Dundrum, Co. Tipperary @ 1pm starting with the Women's race with the Men's race taking place immediately afterwards. Online entry is now LIVE (Monday 25th) and will be closing at midnight on Thursday 28th. Course map here. Directions to Dundrum here. Online entry link is here - https://ireland.entry4sports.com/wp-login Clubs will need to nominate their teams in advance of the race. Can all Clubs please send a team manager to Michael Lillis at the check-in desk tomorrow before the races start to declare their Club teams. CBP's have now been updated. Photos from Saturday and Sunday. Our thanks to photographer, Paul Askins, Dooneen A.C.
Tipperary Throws Festival, Saturday 2nd March in Templemore Track. Programme gets underway at 10am starting with the Shot Putt. Entries on the day. 5 euro per event. E-mail aislinghoey@eircom.net with any queries. Full programme and further details here. REVISED START TIME of 10.30am TOMORROW (SUNDAY) FOR TRIPLE JUMP COMPETITIONS (changed from 10am). First competition will be Girls U/18. See Revised Start Lists here for Munster U/12 to U/19 Indoor Championships this weekend. Any further errors should be sent to ahoey@munsterathletics.com asap. Rulebook can be found here. Munster Qualifiers for Irish Life Health Irish Schools XC Championships. See here. Any corrections to spellings, additions to teams or individual withdrawals should be e-mailed to liamobrien@hotmail.com before Friday 1st March to ensure inclusion in the event programme. Munster Schools Indoor Games, Tuesday 5th March in Nenagh Indoor Stadium. See all the information here. Closing date for entries is 6pm on Friday 1st March. on or before Friday 22nd February 2019. Strong Irish Team selected for European Indoor Championships. See more here. Congrats to Ciara Neville, Emerald A.C. (60m), Phil Healy, Bandon A.C. (400m), Thomas Barr, Ferrybank A.C. (400m) & Sean Tobin, Clonmel A.C. (3000m). See athlete list here. National Juvenile Star Awards 2018 - Congrats to all the Munster Award winners. See list here. AAI Year End Registration Figures for 2018 & January 2019. See details here. AAI Review & Results Sunday. Munster Schools Cross Country Championships, Friday 15th February in WIT Sports Campus. See Provisional results here. Munster U/12 to U/19 Indoor Championships, Saturday 23rd & Sunday 24th February. Timetables: Saturday Sunday . ONLINE ENTRY IS NOW OPEN. Go to https://ireland.entry4sports.com/wp-login and use your usual Club login details. Closing date is midnight on Wednesday 20th February. Any problems with online entry, please contact entrysupport@athleticsireland.ie. Irish Life Health National Senior Indoor Championships, Saturday 16th & Sunday 17th February. Entry List here. Timetable here. See AAI Preview here. AIT International Grand Prix - See Report & Results here. Joe Gough, West Waterford A.C. wins World Masters Athletes Award. Congrats to Joe. See Irish Times Article here. David Sweeney appointed as National Field Event and Combined Events Co-Ordinator. We wish him well in this new role and look forward to working with him. See more here. Watch left behind today (10th Feb) in Nenagh Indoor Stadium after the Munster Junior, Senior & Masters Indoor Championships. Please contact ahoey@munsterathletics.com for more details. AIT International Grand Prix, Wednesday 13th February in AIT International Arena. See details here. Live coverage on TG4 at 7.30pm. Munster Junior, U/23, Senior & Master Walks & 3km Championship - See Results (Updated 13/02/19) here. Irish University Indoor Championships, Friday 8th February in AIT International Arena. See Results here. 5 Cork athletes to receive Sports Ireland Funding. See more here. Irish University Indoor Championships, Friday 8th February in AIT. See results here. Irish Life Health National Indoor Senior Championships. Online entry now open, closing date is 11th February. See more here. Timetable here. Irish Life Health Munster Schools Cross Country Championships willl take place on Friday 15th February in WIT Sports Campus, Carriganore, Waterford. First race gets underway at 12.30pm. See Timetable and Course Map here. Club Entry List for Day 1. See here. Any errors, please e-mail ahoey@munsterathletics.com immediately. Entry list for Day 2 to follow. See parking restrictions at Nenagh Indoor Stadium here for Saturday 9th & Sunday 10th February. Timetable for Saturday 9th here. See Juvenile Competition Booklet here. Timetable for Sunday 10th here. More info here. New National Indoor Record for Alex Wright, Leevale A.C. as Euro standards hit. See more here. Irish Life Health National Juvenile "B", Intermediate, Masters & Juvenile Relay XC Championships, Sunday 3rd February in Dundalk I.T. See AAI Preview here. Results here. Leevale A.C. lead the Irish challenge at Euro Club XC. See more here. Irish Life Health AAI Games - See AAI Preview, Timetable and Entry list here. AAI Juvenile Competition Booklet 2019. See here. East Munster Schools XC Championships, Thursday 31st January in WIT Sports Campus. See Provisional results here. Any errors/omissions to Mary Ashe at maryasheathletics@gmail.com. Online Entry for Munster U/9 to U/11 Indoor Championships plus Walks & 3km and the Munster Junior, Senior & Master Indoor Championships is now open at https://ireland.entry4sports.com/wp-login.php and your usual Club login. Closing date for both days will be midnight on Wednesday 6th February. Munster Development & Performance Squad - next date is this Saturday 2nd February in Templemore Track. Development Squad from 11am to 1pm, cost is 5 euro per athlete. Register on day. Events covered will be Sprints, High Jump, Shot Putt, Javelin & Middle Distance. For the Performance Squad, all events will be covered except for Pole Vault & Walks. Performance Squad from 1pm to 3pm. Further details here. Irish Life Health National Juvenile "B", Intermediate, Masters & Juvenile Relay Cross Country Championships. See entry lists here. New Athletics Ireland Club Captains Workshop. See details here. As weather forecast tomorrow (Thursday 31st) is for rain, the East Munster Schools Cross Country Championships is going ahead as planned in WIT. NCAA Results up to 29th January 2019. See here. Our thanks to Brother John Dooley for the information. Online entry for Munster competitions on 9th & 10th February are currently being set up and should be available to enter this week (28 - 1st Feb). Clubs will be updated by e-mail when link is LIVE. Venues for Day 1 of U/12 to U/19 T&F Championships will be CIT and Day 2 and 3 will be held in An Riocht A.C. Track, Castleisland, Co. Kerry. County & Club Affiliation Forms 2019. See details here. Victory for Alex Wright at Slovakian Indoors. Read AAI Report here. Ciara Mageen sets new Indoor Mile Record. See details here. Irish Life Health National Junior & U/23 Indoor Championships. See Results here. Sportfile pictures here. AAI Review here. World & European Lead Time for Healy in Vienna. See more here. Selection for Armagh Road Races. See here. Marathon Workshop with Mara Yamauchi on 23rd February in Donore Harriers. See details here. European U/20 & U/23 Standards now available. See here. Munster Juvenile & Youth Combined Events Championships (incorporated into the National Juvenile & Youth Combined Events Championships). See Results here. Irish Life Health National Junior & U/23 Indoor Championships. See Timetable and entry lists here. See AAI Preview here. Details about Livestream here. Irish Life Health National Juvenile "B", Intermediate, Masters & Juvenile Relay XC Championships. Closing date for entries is midnight on Sunday 27th January. See all the details here. Irish Life Health Backs Athletics delivering health and lifelong activity. See details here. Munster Star Awards Banquet - The Banquet will take place on Saturday 2nd February at Rathkeale House Hotel, Lower Main Street, Rathkeale, Co. Limerick @ 7.30pm sharp. Tickets cost €30.00 each and are available from Mossie Woulfe. E-mail mossiewoulfe1@gmail.com. Tickets must be booked and paid for by Friday 25th January 2019. Accommodation may be booked by contacting the Rathkeale House Hotel on 069 - 63333. See List of award winners here. Munster Development & Performance Squads - last two dates are Saturday 2nd February and Saturday 23rd March in Templemore Track. See all the details here. Upcoming Coaching Courses in Limerick, Cork & Kerry. See more here. Grace McKenzie, Belgooly A.C. sets McNeese State College, Southland Conference & Irish Indoor Pentathlon Records. Read more here. Results from Day 1 of Munster Juvenile Indoor Championships is available at this link - http://munsterathletics.com/results/2019/results_20012019/menu.html. Updated records here. Irish Life Health National Junior & U/23 Indoor Championships, Sunday 27th January in AIT International Arena. See all details here. Closing date for entries is midnight on Tuesday 22nd January. Irish Life Health National Senior Indoor Championships, Saturday 16th & Sunday 17th February in the National Indoor Arena, Abbotstown. See entry info here. Irish Life Health National Juvenile "B", Intermediate & Masters & Juvenile Relay XC Championships, Sunday 3rd February in Dundalk I.T. See Timetable here. Entry Link will be available here on Fixtures page of AAI website. Irish Life Health National Combined Events Championships. See results here. AAI Review here. Sportsfile photos here. Host Clubs wanted for Irish Life Health Summer Camps. See details here. Athletics Ireland AGM Notice. See here. Celtic International Cross Country - See selected teams here. Results here. Garda Vetting for Athletics Ireland. See details here. Please see details about parking restrictions here for Munster Juvenile Inter-Club Relays & Juvenile Jumps & Throws Day 1 in Nenagh Indoor Stadium on Sunday 20th January. Online entry for the Munster Juvenile Inter-Club Relays & Juvenile Jumps & Throws Day 1 is NOW OPEN. Go to ireland.entry4sports.com and log in with your usual Club details. Leevale A.C. is hosting a high performance Shot Putt Masterclass with Malcolm Fenton (former UK Athletics & England Athletics Lead Throws coach) from 18th to 20th January in the Leevale A.C. High Performance Centre. See all the details here. Coaches/athletes are welcome, places are still available. Contact donalfmoynihan@gmail.com for more information and to book your place. National Indoor League 2019. See all the details here. Aidan Hogan, Rising Sun A.C. Athletics Ireland Ultra Athlete of the Year 2018. Read article from the Evening Echo here. Joe Gough, West Waterford A.C. wins European Masters Association Best Master Male Middle Distance Award for 2018. See more here. AAI article here. 3rd place for Daniel Ryan, Moycarkey Coolcroo A.C./Herne Hill Harriers A.C. at the England U/23 Men's Heptathlon & 10th in Senior competition in Sheffield & 13th place for Brian Lynch, Old Abbey A.C. in the U/20 Men's Heptathlon. See details & results here. Sports Inclusion Disability Charter. See here. Congratulations to all our Munster Star Award Winners for 2018. See List here. The Munster Star Awards Banquet will take place on Saturday 2nd February 2019 in the Rathkeale House Hotel, Rathkeale, Co. Limerick. All award details will be posted here shortly. County Tipperary Senior & Master Indoor Championships, Sunday 30th December in Nenagh Indoor Stadium @ 10.30am. Guests welcome. See Timetable here. Entry details here. Day 3 of Munster Development & Performance Squads, Saturday 29th December in Nenagh Indoor Stadium. Development Squad from 11am to 1pm, 5 euro per athlete. Events covered will be Sprints, Long Jump, Pole Vault, Shot Putt, Javelin, Middle Distance & Walks. Please note that anyone is welcome to join the Middle Distance group which will meet at 11am at the Stadium with coach Sean Finn and then train up in the CBS grounds. The Walks Development & Performance Squads will take place TOGETHER at 1pm with coach, Frank Lynch. All events will be covered for the Performance Squad which will run from 1pm to 3pm. Javelin, Hammer and Discus for the Performance Squad will be out in Borrisokane A.C. Grounds as well as Javelin for the Development Squad. See Squad details including all eligible athletes here. Munster Juvenile Indoor Competitions Booklet 2019. See here. First Munster competition takes place on Sunday 20th January with the Juvenile Inter-Club Relays & Juvenile Jumps & Throws Day 1. See timetable here. Level 3 Coaching Course - March 2019. See details here. Coach Borlee encourages Irish Sprint Coaches to Believe in Magic. See more here. Registration information from AAI. See here. Big fields and exciting races in store at National Novice XC - See AAI Preview here. Strong showing by Munster athletes at European XC - Read AAI review here. 10th for Sean Tobin, Clonmel A.C. (Snr Men), 34th for Kevin Maunsell, Clonmel A.C., 78th for Damien Landers, Ennis Track A.C. (Snr Men), 51st for Michelle Finn, Leevale A.C. (Snr Women), 16th for Darragh McElhinney, Bantry A.C. (U/20 Men), 25th for Stephanie Cotter, West Muskerry A.C. (U/20 Women), 59th for Sophie O'Sullivan, Ballymore Cobh A.C. (U/20 Women), 60th for Laura Nicholson, Bandon A.C. (U/20 Women), 60th for Micheal Power, West Waterford A.C. (U/20 Men). Irish Team Set for Euro Cross Challenge. See AAI Preview here. Action will be on RTE 2 from 12 pm with all the action also streamed on European Athletics http://www.european-athletics.org/index.html. NCAA D2 Cross Country Results for 1st December. See here. Our thanks to Brother John Dooley for the report. Munster Juvenile "B", Intermediate & U/20 XC Championships - See Provisional results here. Congrats to Thomas Barr who was named AAI Overall Athlete of the Year & T&F Athlete of the Year. Well done also to West Waterford A.C. (Best Development Club), Joe Gough, (Best Master Athlete), Alex Wright, Leevale A.C. (Best Endurance Athlete), Aidan Hogan, Rising Sun A.C. (Best Ultra Endurance Athlete), Phil Healy, Bandon A.C. (Most Inspirational Performance on Irish Soil) & Ciara Neville, Emerald A.C. (Best Team Performance with Irish Junior Women's 4 x 100m), See AAI Review here. List of Irish Coaches in the US. See here. Thanks to Brother John Dooley for the information. Online Entry Deadline for Munster Juvenile "B", Intermediate & U/20 XC Championships has been extended to midnight tonight (Wednesday 28th). Big Irish team selected for European Cross Country. Congrats to all the Munster athletes who have been selected. See all the details here. Munster Juvenile "B", Intermediate & U/20 Cross Country Championships, Sunday 2nd December in Cork Athletics Grounds, Slieveroe, Riverstick, Co. Cork. See directions here. Course map to follow. First race gets underway at 11.30am. National Novice & Juvenile Uneven Age XC Championships, Saturday 15th December in Navan Adventure Sports, Navan Racecourse. See information here. Timetable here. Michael Lillis, Munster Cross Country Secretary will enter the top 12 individuals. County Secretaries will enter their County teams that have qualified. Entries can be done at this link - https://events.athleticsireland.ie/ps/event/MunsterQualifiersNationalJuvenileUnevenAges Closing date is midnight on Thursday 6th December. Irish Life Health National Juvenile Even Age & Senior Cross Country Championships - Results here. Photos here. See AAI Review here. Elizabeth Broderick appointed Director of Competitions with AAI. See details here. NCAA Cross Country Championships, 17th November 2018 - See here. Our thanks to Brother John Dooley for the report. Munster Development & Performance Squad - Day 2 on Saturday 24th November in Nenagh Indoor Stadium. Development Squad from 11am to 1pm. Events covered will be short hurdles (Noelle Morrissey), High Jump (Colin Byrne), Middle Distance (Sean Finn), Pole Vault (Eamon Flanagan) & Walks. Please note there will be no javelin session for either development or performance athletes. Anyone is welcome to join the Middle Distance group which will meet at 11am at the Stadium with coach Sean Finn and then train up in the CBS grounds. The Walks Development & Performance Squads will take place TOGETHER at 1pm with coach, Frank Lynch. All events EXCEPT JAVELIN will be covered for the Performance Squad which will run from 1pm to 3pm. Hammer and Discus for the Performance Squad will be out in Borrisokane A.C. Grounds. Provisional Entry for National Even Age Cross Country Championships. See here. See AAI Preview here. 2019 Athlete Carding Scheme - Applications Open. See details here. See Video Footage of Munster Juvenile Inter-Club Relay races from U/10 to U/14 here. Thanks to Paddy Buckley, North Cork A.C. for the footage. At last Sunday's Munster Cross Country in the Middlepiece, Two Mile Borris, an U/19 athlete left a a pair of spikes behind him in the car park area (beside the exit). They were blue and yellow spikes which contained very expensive, custom made orthotics (black). If anyone remembers seeing them or has any information on their whereabouts, could you please e-mail info@munsterathletics.com. Also lost on the day were a pair of Women's prescription purple sunglasses. Any information would be greatly appreciated. NCAA Regional XC Results for 9th November. See here. Thanks to Brother John Dooley for all the information. National Senior, Junior & Juvenile Even Age XC Championships, Sunday 25th November in the National Sports Campus, Abbotstown, Dublin. See all important information here. Munster Juvenile Uneven Age & Senior Cross Country Championships - Final Results. Photos here. More here. Munster Senior Cross Country Championships Eligibility - Please note that only first three individual medal winners in the Senior Women and Senior Men will lose their status. Medals won as part of Club or County teams don't count. Day 2 of Munster Development & Performance Squads, Saturday 24th November in Nenagh Indoor Stadium. Development Squad from 11am to 1pm, 5 euro per athlete. Events covered will be Short Hurdles, High Jump, Javelin, Pole Vault, Middle Distance & Walks. Please note that anyone is welcome to join the Middle Distance group which will meet at 11am at the Stadium with coach Sean Finn and then train up in the CBS grounds. The Walks Development & Performance Squads will take place TOGETHER at 1pm with coach, Frank Lynch. All events will be covered for the Performance Squad which will run from 1pm to 3pm. Hammer, Discus and Javelin for the Performance Squad will be out in Borrisokane A.C. Grounds. See Squad details here. County Secretaries will enter their County teams that have qualified. Entries can be done at this link - https://events.athleticsireland.ie/ps/event/MunsterQualifiersNationalJuvenileEvenAges. Closing date is midnight on Sunday 11th November. Closing date for online entry for Munster Juvenile Uneven Age & Senior Cross Country Championships is midnight tomorrow, Tuesday 6th November. Congrats to Laura Frawley, St. Mary's Charleville/St. Mary's A.C. Limerick & Harry Nevin, St. Francis College Rochestown/Leevale A.C. who both won individual silver medals & bronze & silver team medals at the SIAB Schools Combined Events International in Glasgow on Saturday 3rd November. Team medals were also won by Katie Nolke, Ursuline Waterford/Ferrybank A.C. (10th & bronze U/16 Girls), Dillon Ryan, Thurles CBS/Moycarkey Coolcroo A.C. (8th & silver U/16 Boys), Wymin Sivakumar, Colaiste an Spioraid Naoimh/Leevale A.C. (6th & bronze Boys Over 16) & Diarmuid O'Connor, Colaiste Choilm, Ballincollig/Bandon A.C. (15th & bronze Boys Over 16). See AAI Report here. See Results here. Munster Schools AGM - Monday 19th November @ 8pm in the Cahir House Hotel, Cahir, Co. Tipperary. All interested parties are welcome to attend. NCAA Conference D1 Results for 26th to 29th October 2018. See here. Our thanks to Brother John Dooley for the information. Reminder: Munster Official's Training Course for Coaches & Club Members, Saturday 3rd November in Nenagh Indoor Stadium from 12pm to 3pm. This is a free workshop hosted by Munster Athletics. Coaches and Clubs who have athletes competing at Championships (Counties, Munsters or National Championships) must be represented in Nenagh. At least one member from each Club must be in attendance. E-mails have been sent out to all Clubs since beginning of September. National Marathon title for Lizzie Lee, Leevale A.C. in 2.35.05 with team-mate Jill Hodgins 3rd in 2.47.53 with Leevale A.C. also taking the Women's team title. See details here. Purcell set for Hall of Fame at Irish Life Health Awards. Read all the details here. Reminder & Important Information: Munster Development & Performance Squads tomorrow, Saturday 27th October in Nenagh Indoor Stadium. Development Squad from 11am to 1pm, 5 euro per athlete. Events covered will be Sprints, Shot Putt, Pole Vault, Long Jump, Middle Distance & Walks. Please note that anyone is welcome to join the Middle Distance group which will meet at 11am at the Stadium with coach Sean Finn and then train up in the CBS grounds. The Walks Development & Performance Squads will take place together at 1pm with coach, Frank Lynch. All events will be covered for the Performance Squad. All Throws for the Performance group will meet up in Borrisokane A.C. Grounds at 1pm (except Shot which is 2.15pm). There is no need to come to the Stadium. The Discus and Shot Putt groups will be taken by Sean Whitney, Discus from 1pm to 2.15pm and Shot Putt from 2.15pm to 3.30pm. Athletes are welcome to do both sessions if they so wish. John Sheehan will take Javelin and John O'Farrell will coach Hammer. Munster Juvenile Even Age, Novice & U/23 Cross Country Championships, Sunday 21st October in Beaufort, Co. Kerry. See Results here. Patrick O'Dea Memorial Cross Country races, Lissycasey, Co. Clare, Sunday 28th October. See details here. Munster Juvenile Uneven Age & Senior Cross Country Championships, Sunday 11th November in the Turnpike, Two Mile Borris, Co. Tipperary. See Course Map here. Location & parking details here. Munster Development & Performance Squads Update - See all the details here. Register for the Performance squad by Thursday 25th October. Any more updates will be posted here. 13th place overall after Stage 2 of the 400mH for Miriam Daly, Carrick-On-Suir A.C. at the World Youth Olympics. Miriam ran a best of 1.02.15 over Stage 1 & 2. See Stage 2 Result here. Summary Result here. Updated List of Irish Athletes Based in US Colleges. See here. See results from NCAA Cross Country Invitational races here. Our thanks to Brother John Dooley for the information. Reminder: Closing date for entries for Munster Juvenile Even Age, Novice & U/23 Cross Country Championships is tomorrow, Tuesday 16th October. Irish Schools Combined Events Championships. See Results here. Tuesday 16th October sees the return of the highly successful NIA (New Innovative Athletics) Indoor Athletics Meets in the National Indoor Arena. See all the details here. New to the programme this year is NIA Live Junior - Races for U/10, U/12, U/14, U/16, tickets are 4 euro (Link here). This is followed by the Adults race series with tickets at 7.50 euro (Link here). 10th place overall after Stage 2 of the Long Jump for Sophie Meredith, St. Mary's A.C. Limerick at the World Youth Olympics. Sophie jumped a best of 5.79m. See Results here. 13th place overall in Stage 1 for Miriam Daly, Carrick-On-Suir A.C. in the 400mH at the World Youth Olympics in Buenos Aires. Daly finished 5th in her heat and races again in Stage 2 on Tuesday 16th October. See Results here. 10th place for Sophie Meredith, St. Mary's A.C. Limerick with a best of 5.59m last night (11th October) in Stage 1 of the Long Jump at the World Youth Olympic Games. Result here. Sophie will compete in Stage 2 on Sunday 14th at 18.05 where both her scores will be combined to determine overall placings. Miriam Daly, Carrick-On-Suir A.C. competes in the 400mH tomorrow (Saturday) in Heat 1 at 18.50 Irish time. See more details here. Coverage of the Games can be found on Eurosport. Munster Development & Performance Squads - Dates are Saturday 27th October, Saturday 24th November, Saturday 29th December & two more dates tbc in 2019. Venue is Nenagh Indoor Stadium. Development Squads from 11am to 1pm and Performance Squads from 1pm to 3pm. See Munster Performance List here. Register for Squad here (Performance only). Development Squad athletes can just turn up and register on the day. See all the details here. Budget 2019 Comments from AAI CEO Hamish Adams. See here. Good luck to Sophie Meredith, St. Mary's A.C. Limerick (Long Jump) & Miriam Daly, Carrick-On-Suir A.C. (400mH) who both compete at the World Youth Olympics in Buenos Aires on 11th October & 13th October. Read more here. Irish Schools Combined Events Championships, Saturday 13th October in AIT International Arena, Athlone. See Timetable here. Good luck to all our athletes who are taking part. Munster Junior Endurance Performance Camp Autumn 2018 Report. Read here. Autumn Open Cross Country Festival - Sunday 21st October in National Sports Campus, Dublin. See details here. Olympic Federation of Ireland welcomes Government's Increased Funding for Sport. Read more here. Job Opportunity: Athletics Ireland Director of Competitions. See more here. Departure of Moira Ashton, Athletics Ireland Director of Competitions. Read more here. We wish Moira the very best of luck in her new role. Register for Fit4Class for 2018/2019 School Year. See details here. AAI National Race Walking Championships 2018 - Saturday 8th December in St. Anne's Park, Raheny. See details here. Munster Schools Combined Events Championships. See Results here. Updated records here. Masters Magic in Malaga. See AAI Report here. Application for regrading for 2018/2019 Cross Country Season. See details here. Closing date is Wednesday 10th October. Munster Juvenile Cross Country Competition Booklet 2018/19. See here. Online entry will be open shortly. Munster Juvenile Indoor Competition Booklet 2019. See here. Sports Capital Grants - Free Workshop in Munster hosted by AAI on Thursday 20th September in the Charleville Park Hotel, Charleville, Co. Cork from 7pm to 9pm. Workshop aimed at assisting Clubs to complete their applications. It is necessary to reserve your place should you wish to attend. See all the information here. See AAI website info here. Munster U/20 Endurance Performance Squads for 2018/2019. See all the details here. Munster Squad here. First session takes place in Banna Strand, Co. Kerry from 21st to 23rd September. All selected athletes need to sign up asap. National Marathon Entry List 2018. See here. Munster fixtures for 2019 can now be found here. Timetables have now been added. Sports Capital Grant Applications for 2018. See all the details here. Full Jumps Workshop for Long Jump (Pat Power), High Jump (Barry Pender), Triple Jump (David Murphy) & Pole Vault (Eamon Flanagan) on Sunday 23rd September in Templemore Track @ 11am. For athletes aged 12+ years, all are welcome, 5 euro per athlete. Please contact Pat Power at jumps@athleticsireland.ie to register. Munster Schools Combined Events Championships, Wednesday 3rd October in Nenagh Indoor Stadium @ 11am. Details have gone out to all Munster Schools today (3rd September). Timetable here. Rules here. Closing date for entries is Friday 28th September. Updated Cross Country Fixtures for 2018 can be found here. 2019 calendar will be available shortly. North Cork A.C. Open Juvenile Cross Country Meet, Friday 7th September @ 6pm in Doneraile Park. See all the details here. Endurance Running Workshop in Charleville, Co. Cork on Saturday 8th September from 11am to 4pm in Charleville Park Hotel. See all the details here. See List of upcoming AAI Coaching courses here. St. Cronan's A.C. Cross Country Open Day, Sunday 23rd September in Ballymacahill, Barefield, Co. Clare at 11am. See all the details here. Niamh McCarthy, Eagle A.C. wins European gold in F41 Discus at Para Athletics European Championships. See more here. Noelle Lenihan, North Cork A.C. wins European gold with World record throw in F38 Discus at Para Athletics European Championships. See more here. Orla Barry also took gold at the same Championships in the T57 Discus. See more here. Congrats to all three athletes. iRunForFun Programme: Post Primary Schools Autumn 2018 Sign Up. See all the details here. September Child Safeguarding Newsletter. See here. A Pole Vault Workshop for Beginners will be held in Templemore Track, Co. Tipperary on Saturday 15th September from 11am to 3pm. Cost is 5 euro per athlete. See all the details here. Wins for Nenagh Olympic A.C. & Kerry County in Division 1 of National League Final. See AAI review & results here. A masterful day of athletics in Tullamore. See AAI review & results of Irish Life Health National Masters T&F Championships here. 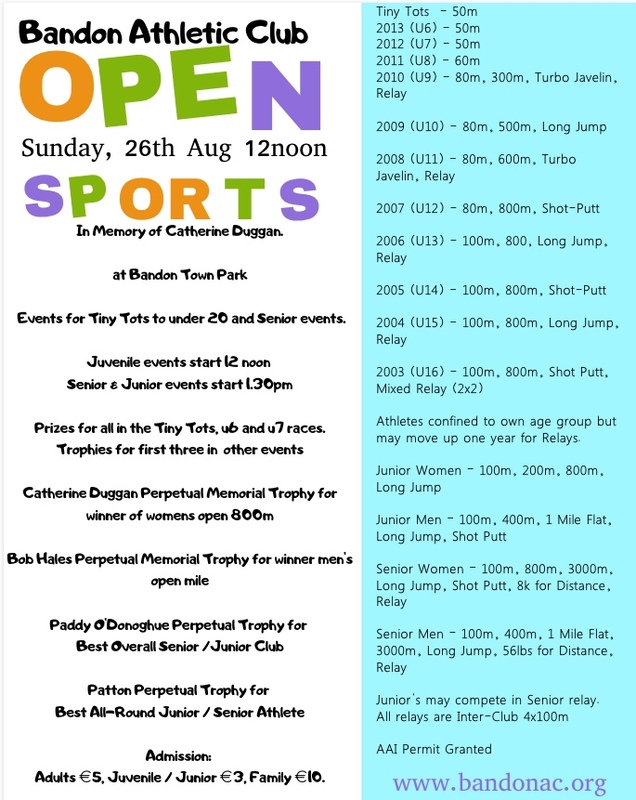 Bandon A.C. Open Sports in memory of Catherine Duggan. Sunday 26th August @ 12 noon in Bandon Town Park. See all the details here. Thomas Barr - "Our European Bronze Medal Hero" By Fintan Walsh, Waterford Athletics PRO. See here. Irish Life Health National League Final, Sunday 19th August in Tullamore. See Timetable here. Irish Life Health National Masters T&F Championships, Saturday 18th August in Tullamore. See Timetable here. Super 6th for Irish Men's marathon team in Berlin. Irish Women's team were 8th led home by Lizzie Lee, Leevale A.C. in 2.40.12. See AAI Review here. Fighting 4th for Gutsy Mageean. See AAI Review here. 4th for 4 x 100m Women's relay team in their SF with a new National Record of 43.80. Congrats to Phil Healy, Joan Healy, Bandon A.C., Ciara Neville, Emerald A.C. & Gina Akpe-Moses. Wright in the Mix & 10th in Europe. Alex Wright, Leevale A.C. finishes 10th in the Men's 20km Walk. See AAI review here. Healy 11th Overall in 200m in Berlin. See AAI Review here. Mageean & Healy Power Through - See AAI Reveiw for Friday Morning's session in Berlin here. Brilliant Barr wins bronze. A big congrats to Ferrybank A.C.'s Thomas Barr who wins historic bronze in the 400mH. See AAI Review here. No joy for English or Curran. See AAI Review on Thursday morning's session here. Reid's Dream debut to Make European Final. See AAI Review of Wednesday evening's session here. Lawler Bows Out in Berlin. See AAI Review of Wednesday morning's session here. Barr Clears First Hurdle into European Final. See AAI Review from Tuesday's evening's session here. Boyce Hits Berlin Wall in Brave Medal Bid. See AAI Reivew from Tuesday morning's session here. Healy hits the ground running. See AAI Review from Day 1 of the European Championships here. Athletics Ireland Office out of operation due to fire. See how to contact Athletics Ireland here. Irish Timetable & Preview for European Championships. See here. Celtic Games, Saturday 4th August in Grangemouth. See Results here. Scottish Athletics photos here. Athletics Ireland photos here. European Athletics Championship Selections. Congrats to Munster selected athletes, Alex Wright, Lizzie Lee & Michelle Finn, Leevale A.C., Phil & Joan Healy, Bandon A.C., Ciara Neville, Emerald A.C., Thomas Barr & Niamh Whelan, Ferrybank A.C. See more here. AAI National Half Marathon, Sunday 12th August. See all the details here. Celtic Games Team Announced. Good luck to our 21 Munster athletes and to the Irish team. See more here. Timetable here. Irish Life Health National Senior T&F Championships. See AAI Review on Day 2 here. Review on Day 1 here. Congrats to all the Munster medal winners. Rob Heffernan Calls Time on Champion's Career. Read more here. Irish Life Health National Senior T&F Championships. See updated timetable and entries here. Liscarroll A.C. are hosting two upcoming events and they would really appreciate your support - Liscarroll A.C. Open T&F Sports on Sunday 12th August @ 1pm in Liscarroll GAA Grounds (details here) & the Tom Fitzpatrick 10km Road Race & new 5km Road race on Friday 17th August @ 7.30pm in Liscarroll. See details here. Athletics Ireland NRWJ (National Road Walking Judge) Level 1 Course. See all the details here. See Results from Day 3 of National Juvenile T&F Championships here. See AAI Review here. Super Silver for Irish team at SIAB Schools T&F International. See AAI Review here. Photos here. See Results here. Join in the Juvenile 4 x 100m Club Mixed Relay event at the National Seniors. See all the information here. Day 3 of Irish Life Health National Juvenile T&F Championships, Sunday 22nd July in Tullamore. See Start Lists here. Timetable here. SIAB Schools T&F International, Saturday 21st July in Grangemouth, Scotland. Good luck to all our athletes who will be competing on the day. See Timetable here. Munster Juvenile "B" T&F Championships, Saturday 21st July in Cork I.T. See Start Lists here. Any changes to Anne Cullinane at juvenilesecretary@munsterathletics.com by 6pm tomorrow (Thursday 19th). Barr & Healy launch Irish Life Health National Senior Championships. See more here. Healy scorches to National 200m record at Cork City Sports. See AAI Review here. See all the results & news from the Cork City Sports here. Matt Lockett Appointed as Athletics Ireland National Endurance Co-Ordinator. See more here. Lecky Soars to World Silver. See more here. Irish Life Health National Juvenile T&F Championships, Day 2. See Results here. See AAI Review here. The Cork City Sports International Athletics Meeting is on this Monday. It will be televised live on TG4 @ 7.15pm. Phil Healy, Bandon A.C. is running in the 100m and many of Munster & Ireland's top athletes are in action. Please tune in, if we don't support Live TV coverage of athletics, then there will not be any more Live TV coverage of athletics! Irish Life Health National Juvenile T&F Championships. See Results from Day 1 here. See AAI Report for Day 1 here. World Silver for Irish Women's 4 x 100m Relay which included Ciara Neville. A huge congrats to the team. Darragh McElhinney, Bantry A.C. 18th in the 5km in a time of 14.53.63. See Interview with Darragh here. 14th in the World for Orla O'Connor, Waterford A.C. and an Irish U20 record of 47.55.40. See Interview with Orla here. See AAI Review for Saturday 14th here. SIAB Schools T&F International, Saturday 21st July in Grangemouth, Scotland. See Timetable here. Busy Weekend of National Juvenile athletics, Saturday 14th & Sunday 15th July in Tullamore. See Start Lists & Timetables here. AAI Preview here. IAAF World U/20 T&F - See AAI report for Friday 13th here. Ciara Neville, Emerald A.C. 4th in her 200m heat in 24.01 and 8th in her SF in 24.68. Conor Morey Leevale A.C. in Men's 4 x 100m Relay where they finished 3rd in their heat & 11th overall in 40.51. See AAI Report for Thursday 12th here. Ciara Neville 5th in her 100m SF in 11.70 & 16th overall. World U/20 T&F Championships, Ciara Neville, Emerald A.C. in action today (11th) in 100m along with Jo Keane, Ennis Track A.C. in SF of 800m. See Timetable & results link here. Jo Keane runs pb of 2.06.91 in her 800m SF to finish 5th. See Interview with Jo here. Ciara Neville runs her 2nd fastest time ever of 11.54 to finish 2nd in her 100m and progress to her SF tomorrow. See Interview with Ciara here. Irish Life Health Juvenile "B" & Inter Club Relays. See Results here. Cork City Sports, Monday 16th July in Cork I.T. at 5.30pm. See all the details here. Morton Games, Thursday 19th July in Morton Stadium, Santry. See all the details here. IAAF World U/20 T&F - World SF for Jo Keane, Ennis Track A.C. in the 800m (2.09.59). See Inteview with Jo here. Keep up to date with all the news, timetables, results etc here. See AAI Report from Day 1 here. National League, Round 2, Sunday 8th July in Santry & Athlone. Well done to all our Munster teams who took part. See Results here. European U/18 T&F - Sunday 8th. See link for timetable, start lists & results here. See AAI Report here. Another gold for Sarah Healy in the 1500m and a 26th place finish for Brian Lynch, Old Abbey A.C. in the Decathlon with 4 new pb's and a final score of 6,306 points. European U/18 T&F - Saturday 7th. See link for timetable and results here. See morning report from AAI here. Evening Report here. Gold for Adeleke in the 200m and a super silver medal in the 800m for Sophie O'Sullivan. See Interview with Sophie here. Miriam Daly, Carrick-On-Suir A.C. finishes 6th in the 400mH SF in a new pb of 61.35 and 10th overall (see Interview with Miriam here) with Brian Lynch Old Abbey A.C. in 24th place after Day 1 of the Decathlon having posted two pbs in the 100m & Long Jump. Entry lists and Timetable for Irish Life Health National Juvenile "B" T&F Championships & Inter Club Relays here. AAI Registration figures for end of June 2018. See here. European U/18 T&F - Friday 6th. See link for timetable & results here. Irish in form as Healy advances to 1500m final, Miriam Daly, Carrick-On-Suir A.C. is 4th in 400mH heat and advances to SF. Ciara Kennelly finishes 20th in qualifying round of High Jump and Sophie O'Sullivan in 800m SF this evening. See AAI Report from morning session here. See Interview with Ciara Kennelly here. Interview with Miriam Daly here. See AAI Report from evening session here. Well done to Sophie O'Sullivan who progresses to the 800m final and to Sarah Healy on winning gold in the 3km. European U/18 T&F Championships.Good luck to our Munster athletes, Ciara Kennelly, Killarney Valley A.C. (High Jump), Sophie Meredith, St. Mary's A.C. Limerick (Long Jump), Miriam Daly, Carrick-On-Suir A.C. (400mH & Medley Relay), Brian Lynch, Old Abbey A.C. (Decathlon), Sophie O'Sullivan, Ballymore Cobh A.C.) & Conor Morey, Leevale A.C. (100m). See Timetable here. See Final List of Entries here. Follow all the action on Eurosport 1 & 2 from Thursday 5th. See more details about the Championships here. See AAI Preview here. Irish Life Health National Team Games & Relays & U/12 & U/13 Field Events - See results here. World U/20 Selections. See AAI post here. See team here. Congrats to Ciara Neville, Emerald A.C. (100m, 200m & 4 x 100m), Conor Morey, Leevale A.C. (4 x 100m), Darragh McElhinney, Bantry A.C. (5km), Jo Keane, Ennis Track A.C. (800m) & Orla O'Connor, Waterford A.C. (10km Walk). Super performances in Tullamore scorcher. See AAI Review of Irish Life Health National Junior & U/23 T&F Champs here. See Results here. National Juvenile Team Games, Juvenile Inter Club Relays and U/12 & U/13 Field Events, Sunday 1st July in Tullamore. See Timetable & Entry Lists here. Irish Life Health National Junior & U/23 T&F Championships, Saturday 30th June in Tullamore. See Timetable and Entry Lists here. 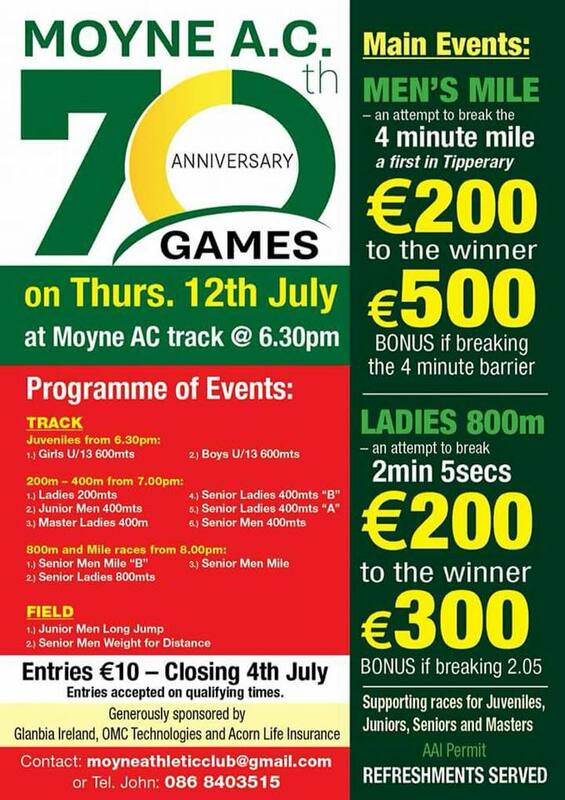 Moyne A.C. 70th Anniversary Games, Thursday 12th July @ 6.30pm in Moyne A.C. Track. See Poster here. Race and entry details here. Irish Life Health National League Round 1 results - See here. Irish Life Health Tailteann Interprovincial. Results here. See Sportsfile pictures here. Irish team for European U/18 T&F Championships announced. Congratulations to selected Munster athletes, Ciara Kennelly, Killarney Valley A.C. (High Jump), Sophie Meredith, St. Mary's A.C. Limerick (Long Jump), Miriam Daly, Carrick-On-Suir A.C. (400mH & Medley Relay), Brian Lynch, Old Abbey A.C. (Decathlon), Sophie O'Sullivan, Ballymore Cobh A.C.) & Conor Morey, Leevale A.C. (100m). See more here. Munster Tailteann team. See here. Timetable here. See AAI Preview & programme here. AAI Sprints, Jumps & Hurdles Coaches Network, Saturday 23rd June in AIT, Athlone. See details here. AAI Job Opportunity for Marketing & Communication Manager. See details here. Munster U/16 to U/19 3km T&F Championships, Saturday 9th June in Castleisland, Co. Kerry. See Results here. NCAA Track & Field 2018 - See latest results here. Our thanks to Brother John Dooley for the report. IMPORTANT INFORMATION: SLIGHT CHANGE TO TIMETABLE FOR MUNSTER U14 TO U19 T&F CHAMPIONSHIPS. The change only relates to some Triple Jumps and Long Jumps over the weekend which has been done to facilitate the athletes. With amended timetable, no athlete has to take part in a Triple Jump and a Long Jump on the same day. Changes are highlighted in purple. Amended timetable here. Update on Munster U/9 to U/11 Team Games Results - This has been a very challenging time for the Clubs involved as well as the Munster Athletics results team. It has been necessary to do a complete review of the Photo Finish system and retrieve the results from it. The review finished last night and the results should be available online tonight (Thursday 14th June). Munster Athletics would like to apologise to all the Clubs who have been affected by this issue and thank them for all their patience and assistance over the past 5 days. It is very much appreciated. Munster U/14 to U/19 T&F Championships, Saturday 16th & Sunday 17th June in Waterford RSC. See Start List here. Any errors to Anne Cullinane at juvenilesecretary@munsterathletics.com before 6pm tomorrow, Wednesday 13th June. Munster Senior T&F Championships, Sunday 10th June in Castleisland. See Final Results here. Munster Masters T&F Championships, Sunday 10th June in Castieisland. See Final Results here. AAI Month End Registrations for May. See here. Tailteann Interprovincial T&F - See Timetable here. Irish Life Health National League 2018 - See all the details here. Start Lists for Munster Senior T&F Championships on Sunday 10th June in Castleisland - See here. Start Lists for Munster Master T&F Championships on Sunday 10th June in Castleisland - See here. Lost & Found: A few items of sports gear (sports bags & runners) were left behind at the Munster U/9 to U/13 T&F Championships in Ennis last weekend. These items will be available for collection from John Devine, Munster Council in Castleisland this weekend. Munster U/9 to U/13 T&F Championships, Sunday 3rd June 2018 in Ennis - Field Results. Irish Schools T&F Championships. See AAI Report here. Photos here. Roundup of Results from Watford, Oordegem & Euro Clubs. See here. AAI Games & Irish Life Health National Combined Events Championships. See AAI Report here. Robinson announced as Irish Team Captain for Le Cheile International. See more here. JF Lawlor, an icon of Irish Hammer Throwing. See AAI Article here. Job Opportunity, National Endurance Co-Ordinator. See more here. Athletics Ireland GDPR Notification. See here. Munster U/9 to U/13 T&F Championships - See Start List here. Any errors/omissions to Anne Cullinane at juvenilesecretary@munsterathletics.com by 6pm on Wednesday 30th May. Amended Relay Rules: Please note that for the Munster U/9 to U/19 Relays, relay markings are now on the blue mark or where there are no markings on the track, it will be the green markings for 400mH. An athlete cannot touch the blue line nor stand on it or go outside it, all athletes must be in front of the blue line when receiving the baton. Munster U/9 to U/11 Team Games Update: Closing date for Munster U9 to U11 Team Games on Saturday 9th June in Castleisland has been extended to 6pm on Tuesday 5th June. Please note that the top 3 teams per event and the top 3 relays per age group from this day qualify from Munster to National Team Games. Change to Munster Senior Pole Vault Competitions: Please note that the Senior Women's & Men's Pole Vault competitions will now take place with the U/15 to U/19 Pole Vault competitions on Saturday 16th June in Waterford RSC. See Timetable here. Munster Schools T&F Championships, Saturday 19th May in Castleisland, Co. Kerry. See Preliminary results here. See AAI Report here. Updated Results for Munster Half Marathon and Marathon Championships: Women's Half Marathon Results Men's Half Marathon Results Women's Marathon Results Men's Marathon Results. Any errors/omissions, please e-mail mossiewoulfe1@gmail.com. Munster Schools T&F Championships, Saturday 19th May in Castleisland. See Timetable here. Keep up to date with all news at www.munsterschoolsathletics.org. Guidance for Clubs on GDPR. See details here. Irish Schools Athletics Champions 1916 - 2017 (updated). See here. NCAA Conference Results for 10th to 13th May. See report here. Our thanks to Brother John Dooley for the details. Munster Juvenile Outdoor Competition Booket can be found here. Online Entry now open for the Munster U/9 to U/13 Track & Field Championships and the Munster U/9 to U/11 Team Games. Closing dates are midnight on Friday 25th May and Friday 1st June. See all the details here. Please note that the U/16 to U/19 3km races all take place on Saturday 9th June in Castleisland with the Team Games. Enter as usual under the U/14 to U/19 Championships. In relation to the Relays, the only teams that have to qualify from Munster to National are the U/9 to U/11 relays being held in Castleisland on the day of the Team competitions (9th June). All other relays from U/12 to U/19 are qualifiers from their County only. Important Note about National Juvenile U12 & U/13 T&F Championships: The Field Events for the U/12 & U/13 National Juvenile T&F Championships will be held with the National Juvenile Team Games on Sunday 1st July. This means that those age groups will only have Track Events on Saturday 14th & Sunday 15th July. See AAI Juvenile Competition Booklet for 2018 here (pages 28, 36 & 37). Kerry Junior, Senior & Masters T&F Championships @ 11.30am in An Riocht A.C. Track, Castleisland. GUESTS WELCOME. See all the details here. NCAA Results for 26th to 29th April 2018. See here. Our thanks to Brother John Dooley for the report. Munster Schools T&F Championships, Saturday 19th May in An Riocht A.C. Track, Castleisland, Co. Kerry. See Timetable here. Please note that all Pole Vault competitions will take place separately on Wednesday 16th May in Cork I.T. at 5pm. Welcome Message from new Athletics Ireland CEO, Hamish Adams. See here. Irish Marathon Team announced for European Championships. Congrats to Lizzie Lee and Claire McCarthy, Leevale A.C. who have both been selected. See AAI Report here. Irish Life Health National Road Relay Championships. See AAI Report & results here. NCAA Results for 19th to 22nd April. See here. Our thanks to Brother John Dooley for the report. See all 2018 reports here. Leevale A.C. Juvenile Open Sports, Sunday 22nd April in CIT. See report, results & photos here. Munster Junior & U/23 T&F Championships See Provisional Results here. Any errors/omissions to tfsecretary@munsterathletics.com. Munster Juvenile Pentathlon Outdoor Championships. See Provisional Results (individual performances) here. Girls Overall Pentathlon Results here. Boys Overall Pentathlon Results here. Any errors/omissions to juvenilesecretary@munsterathletics.com. Changes in Middle Distance Races for Munster Juvenile T&F Championships: Please note that all 800m races for U/14 to U/19 athletes will be run on Saturday 16th June, all 1500m races will be run on Sunday 17th June and all 3000m races will now be run with the Munster Juvenile Team Games in Castleisland on Saturday 9th June. Revised timetables can be found on our "Fixtures" page. See Provisional Start Lists for Munster Juvenile Combined Events Championships here. Any errors/omissions to Anne Cullinane juvenilesecretary@munsterathletics.com immediately. See Provisional Start Lists for Munster Junior & U/23 T&F Championships here. Any errors/omissions to Esther Fitzpatrick, tfsecretary@munsterathletics.com immediately. Ennis Track A.C. Open Sports, Sunday 29th April @ 12 noon in Lee's Road, Ennis, Co. Clare. See all the information here. NCAA Results for 12th - 15th April. See here. Our thanks to Brother John Dooley for the report. The Munster Online Entry system for the Juvenile Combined Events and the Junior & U/23 T&F Championships has been re-opened until midnight tonight (Tuesday 17th April) for any late entries. No entries will be taken after this. Shona Heaslip, An Riocht A.C. reigns supreme in the Park. See AAI Report here. Trio Selected for IAAF Race Walking Champs in China. Alex Wright, Leevale A.C. selected for the 20km race. See AAI Report here. Leevale A.C. Open T&F Meets - Juvenile Meet on Sunday 22nd April and Senior Meet & Throws Festival on Monday 7th May. See all the details here. Most Recent April NCAA Results from the US. See Report here. Our thanks to Brother John Dooley for all the information. REMINDER: The Final session of the Munster Development & Performance Squads takes place on Saturday 14th April in Templemore Track. Development Squad takes place from 11am to 1pm and is open to all athletes aged 12 years+. The squad will cost 5 euro per athlete. Please check in at the venue from 10.30am. Events covered on the day will be SHORT HURDLES (Noelle Morrissey), JAVELIN (Brian Scanlon), HIGH JUMP (Martin O'Grady) & MIDDLE DISTANCE (Sean Finn). The Walks Development Session will take place with the Performance Session (1pm to 3pm). The Performance Squad will run from 1pm to 3pm for all selected athletes. All events will be covered except for Pole Vault which will take place on Sunday 15th April in Templemore Track (weather permitting) from 12 noon to 3pm. AAI Spring Throws, Sunday 8th April in Templemore. See AAI Review & results here. Sportsfile pictures here. Juveniles round out indoor season in style. See AAI Review & results here. Sportsfile pictures here. AAI Month End Registrations for March 2018 - See here. Junior Endurance Camp Supported by Affidea. See AAI Report here. 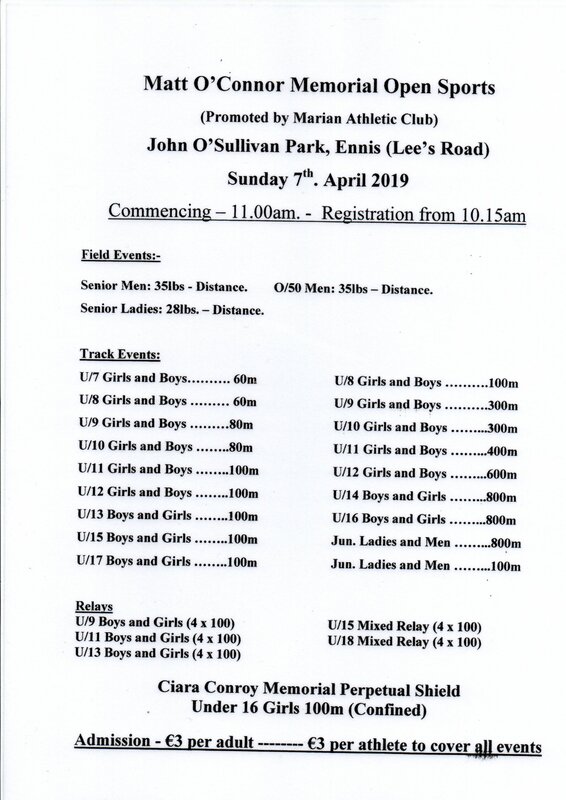 Marian A.C. Matt O'Connor Memorial Open Sports, Sunday 15th April in the John O'Sullivan Park, Lee's Road, Ennis, Co. Clare @ 11am (registration from 10.15am). See all the details here. Irish Life Health National Spring Throws, Sunday 8th April in Templemore. See Timetable here. Irish Life Health National Juvenile Indoor Championships, Day 1. See Provisional Entry Lists and Timetable here. See AAI Preview here. Lifford Strabane A.C. 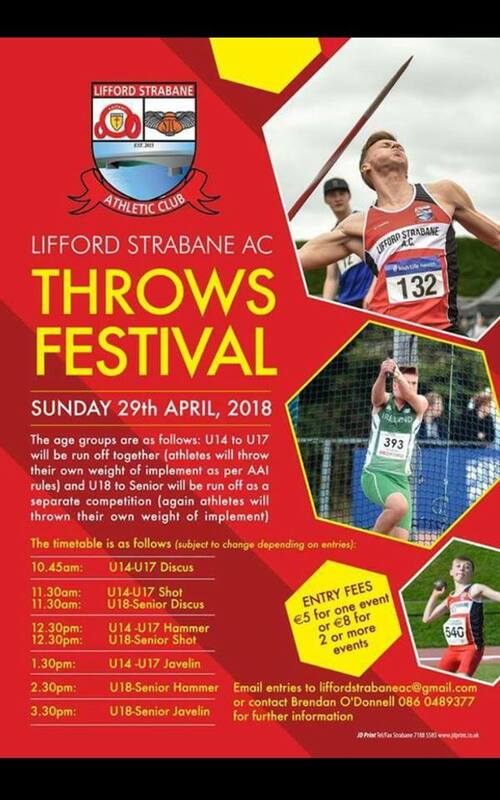 Throws Festival, Sunday 29th April. See details here. National 10km Championships, Sunday 15th April. See all information here. Tipperary Throws Festival, Monday 2nd April in Templemore. See Full Results here. Latest March NCAA Results. See here. Our thanks to Brother John Dooley for the report. See Start List here for Munster 4 Mile Road Championships on Monday 2nd April. Any errors/omissions to mossiewoulfe1@gmail.com by 4pm Sunday 1st April. Early Outdoor and NCAA D2 Results to 30th March 2018. See here. Our thanks to Brother John Dooley for the report. Day 3 of Irish Life Health National Juvenile Indoor Championships, Sunday 25th March. See AAI Review and results here. Register here for the Ton Le Gaoithe Meet on Saturday 5th May in Waterford RSC. See more information here. Poster here. Congratulations to Joe Gough, West Waterford A.C. who is double European Indoor Champion in the M65 800m (2.22.36) & 1500m (5.05.16) setting a new Irish 1500m record, to Jim O'Shea, Farranfore Maine Valley A.C. who won gold in the M75 Long Jump (4.00m) and Annette Quaid who won bronze in the W40 800m. See Full Results here. See Irish Results here. Irish Master athletes latest medal haul from the European Master Indoor Championships in Madrid is 27 (8 gold, 13 silver & 6 bronze). Congrats to all. Irish give it their all in Valentia at World Half Marathon. Lizzie Lee & Claire McCarthy, Leevale A.C. 46th & 57th in personal best times of 1.13.19 & 1.14.20. See AAI Review here. Medals in Nottingham for Irish SIAB Teams. See AAI Report & Results here. US Collegiate Circuit Success for Grace McKenzie, McNeese/Belgooly & Fearghal Curtin, Charleston Southern University/Youghal A.C. Read all the details here. Irish Team all Set for World Half Marathon. See AAI Preview here. SIAB Schools International XC Teams Set for Nottingham. See more here. Irish Life Health National Juvenile Indoor Championships - Day 3 on Sunday 25th March. See Provisional Entry List and Timetable here. See AAI Preview and Link for Live Stream here. Athletics Ireland and Limerick Athletics will host a workshop on "Strength & Conditioning for the Young Athlete" on Thursday 19th April in the Absolute Hotel, Sir Harry's Mall, Limerick from 6.30pm to 9.30pm. Open to all athletes age 16+. See all the details here. Latest Coaching Courses for the South East can be found here. Leevale A.C. launches their 50th Anniversary book "Leevale, Home of Champions" on Wednesday 28th March at 6pm in the Leevale High Performance Centre on Farranlea Road. The book will be launched by Leevale Olympian and World Champion, Derval O'Rourke. All are welcome to attend. The book is available to pre-order here and will be available for purchase at the launch. Adeleke Aces Athlone Again - See AAI Review from Day 2 of the Irish Life Health National Juvenile Indoor Championships here. Congratulatons to Pat Murphy, Castleisland A.C who won double silver Walks medals in the 1500m & 3km distances in Toronto at the Canadian Masters Indoor Championships on 10th/11th March (results here) & then travelled to Maryland for the US Masters Indoor Championships where he won a further 2 silver Walks medals on 17th/18th March (results here). IAAF & European Athletics Appointments for 2018/2019. See Irish appointments here. ONLINE ENTRY NOW OPEN for the Munster Juvenile Pentathlons & the Junior & U/23 T&F Championships in Templemore Track on Saturday 21st April. Closing date for receipt of entries is midnight on Monday 16th April. See all the details here. ONLINE ENTRY NOW OPEN for the Munster 4 Mile Road Championships on Monday 2nd April in Castlelyons, Co. Cork. Closing date for receipt of entries is midnight on Wednesday 28th March. See all the details here. SIAB Schools Cross Country International, Saturday 24th March in Wollaton Park, Nottingham. See Timetable and Course Map here. 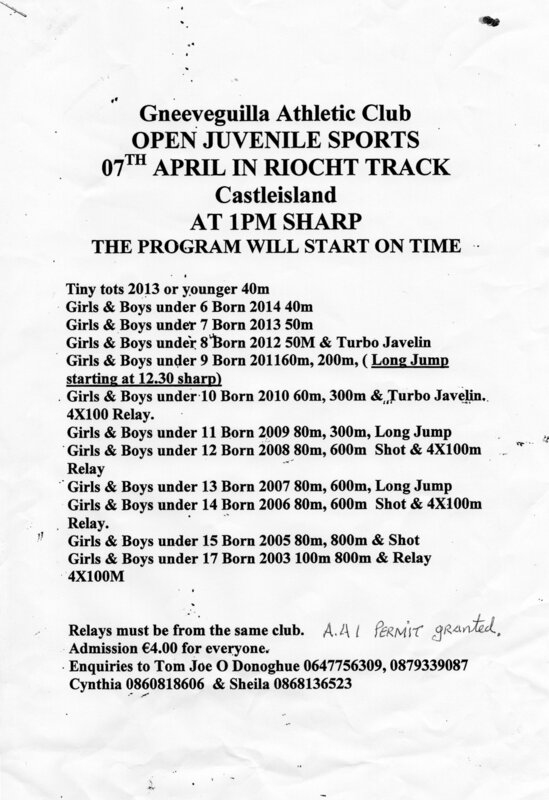 Gneeveguilla A.C. Open Juvenile Sports on Sunday 15th April @ 1pm in An Riocht A.C. Track, Castleisland, Co. Kerry. See all the details here. Children First Act 2015 - See important information here. Irish Life Health National Juvenile Indoor Championships - Day 2 on Sunday 18th March. See Provisional Start Lists and Timetable here. Irish Life Health Irish Schools Cross Country Championships - See AAI Review & results here. Irish Life Health National Master Indoor Championships - See AAI review and results here. Solid Performances from Irish Walkers in Switzerland. See AAI Review here. 10th place for Kate Veale, West Waterford A.C. in Senior Women's 20km. Round Up of Day 1 of European Throws Cup. See AAI Review here. Round Up of Day 2 of European Throws Cup. See AAI Review here. Irish Universities Cross Country Championships - See Results here. Munster Star Awards Banquet, Friday 16th March - For everyone that has ordered tickets from event organiser, Vincent McCarthy, can you please confirm with him by return e-mail: vmccarthykilnaboy@eircom.net or mobile: 087 0636236 that you will still be in attendance on the night. Tickets are still available to purchase. Munster Half Marathon & Marathon Championships, Sunday 6th May in Limerick (being held in conjunction with the Bon Secours Hospital Great Limerick Run). See all the information here. Link for entry can be found here. To enter, all athletes have to do is select their Club from the Club dropdown list on the entry form for the Bon Secours Hospital Great Limerick Run and they are automatically entered in the Munster Championships. Ten Irish athletes picked for the World Half. See details here. Congrats to Munster athletes, Lizzie Lee & Claire McCarthy, Leevale A.C. (see more here) & Clonmel based Sergiu Ciobanu, Clonliffe Harriers A.C. who have all been selected. School's Stars to Clash in Carrignamore at Irish Schools XC Championships. See Preview here. Munster Schools Indoor Games 2018 - See Results here. Endurance Coaches Network (ECN) 6. See all the details here. Magic Masters Set for Athlone. See AAI Preview here. The Final session of the Munster Development & Performance Squads takes place on Saturday 14th April in Templemore Track. Development Squad takes place from 11am to 1pm and is open to all athletes aged 12 years+. The squad will cost 5 euro per athlete. Please check in at the venue from 10.30am. Events covered on the day will be SHORT HURDLES (Noelle Morrissey), JAVELIN (Brian Scanlon), HIGH JUMP (Martin O'Grady) & MIDDLE DISTANCE (Sean Finn). The Performance Squad will run from 1pm to 3pm for all selected athletes. All events will be covered except for Pole Vault which will take place on Sunday 15th April in Templemore Track from 12 noon to 3pm. Healy bows out with brave run in Birmingham. See more here. Heroic Healy advances to World 400m Semi-Final as Ciara Neville, Emerald A.C. finishes 7th in 60m sprint heat with 7.47. See more here. St. Senan's A.C. Open T&F Sports, Easter Monday, 2nd April in Kilmacow Sports Complex @ 1pm. See all the details here. Tipperary Throws Festival has been rescheduled to Easter Monday, 2nd April in Templemore Track. See all the details here. Due to adverse weather conditions, the Munster Star Awards Banquet scheduled for tomorrow night (Saturday 3rd March) has been cancelled and will be re-scheduled for Friday 16th March at the same venue, the Auburn Lodge Hotel in Ennis. Irish Life Health National Masters Indoor Championships is POSTPONED until Saturday 10th March. See more here. Day 1 of the Irish Life Health National Juvenile Indoor Championships is now moved to Saturday 7th April. See all the details here. As of today (Thursday 1st March), the Munster Star Awards scheduled for Ennis on Saturday 3rd March are going ahead. Any updates on this status will be posted here so please keep checking over the next two days. Irish Schedule for World Indoors - See here. Severe Weather Warning for Snow/Ice. See how to contact AAI during the adverse weather here. NOTICE - Monitoring Weather Conditions for National Master Indoor Championships. See details here. 3 weeks to go to the Tralee Harriers A.C. 5km, 10km, Half and Full Marathon which are almost sold out. To be in with a chance to take part, get your entry in soon. Register here - https://register.primoevents.com/ps/event/TraleeInternationalMarathon2018. Bespoke T-Shirt & medal for all finishers. Designed glass trophies for tiop 3 Men and Women in all races and top Masters 0/40, 45, 55 & 60+. See poster here. Munster Star Awards Banquet, Saturday 3rd March in the Auburn Lodge Hotel, Galway Road, Ennis, Co. Clare @ 7.30pm. Congratulations to all our Award Winners who are listed here. NCAA Results for 22nd to 25th February. See details here. Thanks to Brother John Dooley for the report. Irish Life Health National Master Indoor Championships, Sunday 4th March in AIT International Arena. See Timetable here. Athletics Ireland Race Series 2018 - See all the details here. Ferrybank A.C. Open Sports, Sunday 8th April @ 12 noon in Waterford RSC. See details here. See Results from Munster Schools Cross Country Championships here. See AAI Review here. Adam King, Iveragh A.C. selected for Ireland to compete at European Throwing Cup in Leiria, Portugal on 10th/11th March. See full team here. Joe Gough, West Waterford A.C. sets new M65 800m Indoor World Record running 2.16.65 in Abbotstown on Thursday 22nd February. The previous record dated back to 1994 and was held by Canadian, Earl Fee at 2.16.80. See West Waterford AC FB page here. Grace McKenzie, Belgooly A.C. breaks Pentathlon 4000 points barrier and set new McNeese State College record. See details here. Tipperary Throws Festival, Saturday 10th March in Templemore Track. See all the details here. NCAA Results for 8th - 18th February. See here. Our thanks to Brother John Dooley for the report. Healy heads team of four for World Indoors. See AAI Report here. Congrats to Munster athletes, Phil Healy, Bandon A.C. and Ciara Neville, Emerald A.C. who will both travel to Birmingham next month to compete at the World Indoor Championships. Healy will contest the 400m while Neville will run the 60m. Munster Schools Cross Country Championships, Friday 23rd February in WIT Sports Campus, Carriganore, Waterford. First race gets underway at 12.30pm. See Course Map, Timetable, Directions and other information here. Munster U/13 to U/19 Indoor Championships: IMPORTANT INFORMATION - See housekeeping rules for the Championships here which includes parking arrangements at the stadium. See Munster Indoor Rules here. Please circulate to all your applicable Club members. Heat qualification criteria for the sprints and outside track are here. Please note that there is a charge at the door for entry - Adults are 5 euro each and children are free. Payment in cash only, no facility for cards. Affidea Ireland Junior Endurance Camps. See Report here. AAI Month End Registrations for January 2018. See here. AAI Coach Injury Prevention Manual. See details here. Foster Flies as Records Fall in Abbotstown. See AAI Review and Results here. Congratulations to our Munster athletes who received National Juvenile Star Awards for 2017 at the Tullamore Court Hotel on Saturday 17th February - Darragh Miniter, St. Mary's A.C. (Clare), Reece Ademola, Leevale A.C. (Cork), Rachel Bowler, Tralee Harriers A.C. (Kerry), Sophie Meredith, St. Mary's A.C. (Limerick), Daniel Ryan, Moycarkey Coolcroo A.C. (Tipperary), Shane Monagle, Tramore A.C. (Waterford), Darragh McElhinney, Bantry A.C. (Robin Sykes Achievement Award), Aimee Hayde, Newport A.C.(Aine Pobjoy Award for Outstanding Performances by an U/16 athlete), Laura Nicholson, Bandon A.C. (Breda Synott Celtic Games Female) & EYOF medal winners, Niamh Foley, St. Mary's A.C. Limerick, Miriam Daly, Carrick-On-Suir A.C. Munster also won the Mc Guinness Cup for Best T&F Region, Cork won the McAuliffe Cup for Best T&F County and the O'Meara Cup for Best "B" CC County with Leevale A.C. winning the Drifter Cup for Best T&F Club and Ennis Track A.C. winning the John Smyth Cup for Best "B" CC Club. See AAI Report here. See Start Lists here for Munster U/13 to U/19 Indoor Championships. Any corrections to mossiewoulfe1@gmail.com by 6pm on Tuesday 20th February. Please note that any athletes wishing to avail of OPEN ENTRY to the National U/17, U/18 & U/19 Indoor Championships must be entered in the corresponding event for the Munster Indoor Championships. Awesome Weekend in Store in Abbotstown. See more here. GT5k Series 2018 Launched. See more here. Cool Runnings in Clarinbridge. See AAI review and results for National Juvenile "B" & Inter/Masters XC Championships here. Munster Star Awards Banquet 2018 - Can anyone who intends going to the Munster Star Awards, please book your tickets with Vincent McCarthy as soon as possible. Vincent can be contacted at e-mail: vmccarthykilnaboy@eircom.net or mobile: 087 0636236. Reminder also to athletes to forward their achievements and passport size photo to Michael Lillis if they want to be included in the Star Awards Booklet - email: michaellillis@eircom.net. Also, can all athletes please let Esther Fitzpatrick know if they are attending the Awards Night if they haven't done so already. Please e-mail tfsecretary@munsterathletics.com or TEXT to 087 6888591. Munster U/9 to U/12 Indoor Championships: IMPORTANT INFORMATION - See housekeeping rules for the Championships here which includes parking arrangements at the stadium. See Munster Indoor Rules here. Please circulate to all your applicable Club members. See heat qualification criteria for the 60m here. Both the Girls and Boys U/12 High Jump competitions will take place on Saturday as per the timetable. Due to the National Cross Country Relays in Galway on Sunday 11th, the Boys U/12 600m will be held over until 1.30pm. East Munster Schools Cross Country Championships. See Results here. The first 15 individuals and the first 4 teams in each age category for Girls and Boys qualify for the Munster Schools Cross Country Championships in WIT Sports Campus, Carriganore, Co. Waterford on Friday 23rd February. West will be awake with Cross Country action. See AAI Preview, timetable and entry lists here. Do you want to win 500 euro worth of athletics equipment for your Club. See details here. NCAA Indoor Early February results 2018. See report here. Our thanks to Brother John Dooley for the results. See more here on how Grace McKenzie, Belgooly A.C. is progressing for her 2018 season at McNeese State University having been named Sports Person of the Week by local news network Louisanna KPLCTV. Munster Schools Indoor Games. Tuesday 6th March in Nenagh Indoor Stadium. All details have gone out to all Munster schools. See all the details here. Barr & Healy Shine at AAI Games on Busy Weekend. See AAI Review and results here. Purchase Tickets for the National Indoor Championships - See more here. NCAA Early Indoor Season Results - See here. Our thanks to Brother John Dooley for the report. Munster Star Awards Banquet on Saturday 3rd March in the Auburn Lodge Hotel, Ennis, Co. Clare. For the Awards Booklet, can all award winners please send a photo and a short piece on themselves to Michael Lillis at ccsecretary@munsterathletics.com by Friday 23rd February at the very latest. See all the Award Winners here. Munster U/9 to U/12 Indoor Championships. See Start Lists here. Any corrections to mossiewoulfe1@gmail.com by 6pm on Wednesday 7th February. Clonliffe and DCH retain Indoor League Crowns with Nenagh Olympic A.C. Men's team in 4th place. See AAI review and results here. AAI Indoor Games Provisional Entry List. See here along with Timetable. Barr to star in AAI Games. See AAI Preview here. DCH & Clonliffe Favourites to Retain Indoor League titles. See here. REMINDER - The Munster Convention takes place on Saturday 3rd February in the Horse & Jockey Hotel, Thurles, Co. Tipperary at 12 noon. See Munster Juvenile PRO Report for 2017 here. 2018 Athletics Meets for Throwers. See here. Neville and Adeleke Light Up Athlone. Ciara Neville, Emerald A.C. runs 7.34 to set a new CBP at National Junior Indoors. See AAI Review & results here. Athletics Ireland Updated Statistics - Roll of Honour. See details here. AAI Year End Registrations 2017. See here. Ireland's next generation set for Athlone. See AAI Preview, Start List & Timetable for National Junior & U/23 Indoor Championships here. Online entry is now open for the Munster U/13 to U/19 Indoor Championships. See Timetable here. Online entry link is here - https://sso.primoevents.com/sso/. All details are also on our "Forms" page here. Any problems with online entry, please e-mail ahoey@munsterathletics.com. Closing date for receipt of entries is midnight on Friday 16th February. Online entry is now open for the AAI Masters, Intermediate, Juvenile B & Juvenile Relays Cross Country Championships. See all the details here. Online entry is now open for the AAI Indoor Games. See all the details here. A number of athletes were left short on medals at the Munster Senior & Masters Indoors. These medals are being ordered. If any other athlete did not receive/collect their medal, please email indoorsecretary@munsterathletics.com to make arrangements by 6pm Monday 29th January. Online entry is now open for the Munster U/9 to U/12 Indoor Championships which also incorporates the Munster Juvenile Walks on Sunday 11th February. See Timetable here. Online entry link is here - https://sso.primoevents.com/sso/. All details are also on our "Forms" page here. Any problems with online entry, please e-mail ahoey@munsterathletics.com. Closing date for receipt of entries is midnight on Friday 2nd February. See updated list here of Irish athletes currently in the US on Scholarships. Keep up to date with their results here. Our thanks to Brother John Dooley, AAI Liaison for US Based Athletes for all the information. See updated Results for Munster Juvenile Inter-Club Indoor Relay Championships here. The first 3 teams from U/12 to U/19 have qualified for the National Juvenile Indoor Relay Championships in AIT on Sunday 11th March. Can all Clubs please confirm their team names to tfsecretary@munsterathletics.com by return as all entries for National have to come through the Munster Juvenile Secretary. See Photos here. Our thanks to Paul Askins, Dooneen A.C. for the photos. Irish Life Health National Junior & U/23 Indoor Championships, Sunday 28th January 2018 in AIT International Arena. See Timetable here. See Provisional Start List here. AAI Juvenile Competition Booklet 2018 - See here. Munster Juvenile Indoor Booklet here. Host Clubs wanted for 2018 Summer Camp Programme. See details here. Apply for Irish Schools Team Manager Positions. See more here. National Combined Events Championships. Congrats to our National record breakers, Brian Lynch, Old Abbey A.C. (Youth Boys) & Harry Nevin, Leevale A.C. (Boys U/15) and to all our medal winners. Gold medals - William Bello, Ennis Track A.C. (BU/14), Ava Rochford Ennis Track A.C. (GU14), Laura Frawley, St. Mary's A.C. LK (GU15), Harry Nevin, Leevale A.C. (BU15), Brian Lynch (Youth Boys) & Tom O'Brien, Waterford A.C. (M50+). Silver medals - Kyle Ettoh Leevale A.C. (BU14), Jordan Kissane, Tralee Harriers A.C. (BU15), Darragh Miniter, St. Mary's A.C. Clare (Youth Boys), Emily Wall, Leevale A.C. (GU16); Bronze medals - Cillian Griffin, Tralee Harriers A.C. (Youth Boys), Martin Curley, Ennis Track A.C. (M40-49), Emily O'Mahony, Waterford (Youth Girls) & Katie Walsh, Carraig na BhFear A.C. (Junior Women). See AAI Review and results here. Munster Juvenile Relay Championships, Sunday 21st January in Nenagh Indoor Stadium - See Provisional Start List here. Any errors/omissions, please e-mail Mossie Woulfe by return at mossiewoulfe1@gmail.com. Combined Events to Kick Off 2018 - See AAI Preview, Start Lists and Timetable here. Irish Team Selection for Armagh International Road Race - See here. Congrats to Laura Nicholson, Bandon A.C. who was selected for the 3km Women's team. Provisional entry list and timetable for National Combined Events - See here. Indoor League 2018 - See AAI Review and results here. Fionnuala captains Team Europe to victory at Edinburgh - See AAI Review here. 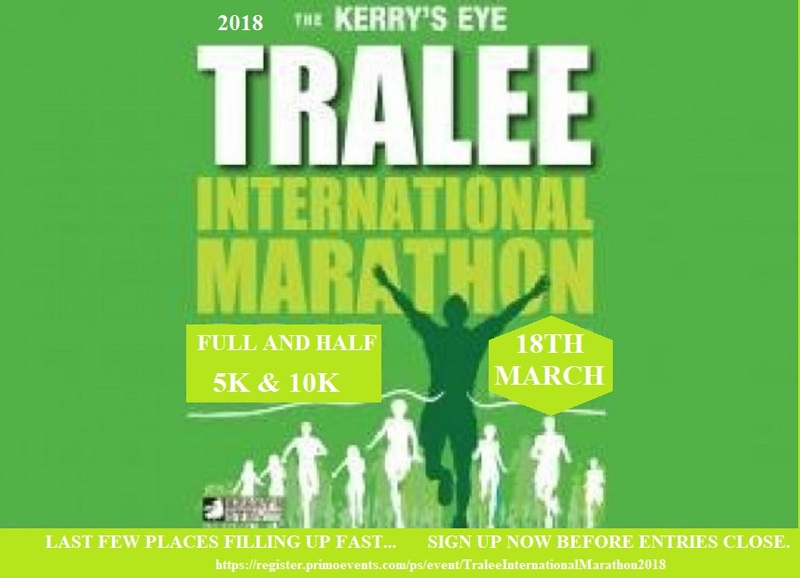 https://register.primoevents.com/ps/event/TraleeInternationalMarathon2018. More information on the Tralee Marathon FB page at this link - https://www.facebook.com/traleeharriersannualruns. Early Season NCAA Indoor Results from the US - See here. Luke Horgan, Leevale A.C. & Grace McKenzie, Belgooly A.C. & Fearghal Curtin, Youghal A.C. featured. The date for the Munster Juvenile Walks has been changed. The Walks for Girls and Boys will now both take place on Sunday 11th February with the U/9 to U/12 Championships. Start time will be 2pm with first race Girls U/14 & U/15. See Revised Timetable here. Munster Senior & Masters Indoor Championships. See updated results here. Many thanks to all the athletes and Clubs who supported the event and to all who helped out on the day. Any amendments, please e-mail indoorsecretary@munsterathletics.com. Munster Juvenile Inter-Club Relay Championships, Sunday 21st January 2018 in Nenagh Indoor Stadium @ 11am. See Timetable here. Please note that all Relays from U/12 to U/19 have to compete at the Munster Championships and qualify in order to be eligible to compete at National level. There are no OPEN ENTRIES to National for Juvenile Inter-Club Relays. See link here to enter relays online. See Provisional Start Lists for Munster Senior & Masters Indoor Championships here. Any omissions or errors, please notify indoorsecretary@munsterathletics.com by midnight Thursday January 11th. A reminder that masters are limited to 4 events. No new entries or entry changes will be accepted on Sunday. A reminder that the programme has changed. See Revised programme here. Antrim International Cross County & Celtic International. See AAI Review here. Congrats to Munster individual medal winners, Aimee Hayde, Newport A.C. (2nd U/17 Women's race) & Stephanie Cotter, West Muskerry A.C. (3rd U/20 Women's race). Laura Crowe & Shona Heaslip, An Riocht A.C. were 18th & 19th in the Senior Women's race with Kevin Maunsell, Clonmel A.C. in 9th in the Senior Men's race & Mark Hanrahan in 10th place. See Revised Timetable here for Munster Senior & Masters Indoor Championships on Sunday 14th January. Munster Senior & Masters Indoor Championships, Sunday 14th January UPDATE: The PROGRAMME for this competition has been REVISED. The warm up area in Nenagh is currently unavailable so the programme has been revised to allow the outside track be available for warm up in the morning and part of the centre track will be available for warm up in the afternoon. Placings in the Senior 60m race will now be decided based on times. ONLINE ENTRY - If a Club is having difficulty with online entry, please e-mail entries to indoorsecretary@munsterathletics.com by midnight on Tuesday (January 9th). Late entries will be refused. See Results - Junior & U/23 Walks. Congratulations to all who took part in the 2018 Munster Junior & U/23 Indoor Championships. A sincere thanks to all who helped out. A number of athletes had Championship Best Performances. Well done to Sophie Meredith, St. Mary's A.C. Limerick (5.94m Junior Long Jump), Aoibheann O'Brien, Tralee Harriers A.C. (5.32m U/23 Long Jump), Raymond Walsh, Abbey Striders A.C. (4.00m U/23 Pole Vault), Seamús McMahon, Shannon A.C. (8.50m U/23 Weight for Distance), Ciara Cummins, Nenagh Olympic A.C. (2.19.36 U/23 800m) and the Leevale A.C. Junior Men's team (1.36.30 4 x 200m Relay). In the 3km Walks, there were Championship Best Performances by Gearóid McMahon, Shannon A.C. (Junior 13.29.16), Evan Lynch, Clonmel A.C. (Senior 13.13.39), Ross Alexander, Coolquill A.C. (M35 14.58.88) and guest Sean McMullin, Mullingar Harriers A.C. (M65 17.12.22). See Provisional Start Lists here for Munster Juvenile/Youth Pentathlon Championships. Any errors or omissions to be notified to mossiewoulfe1@gmail.com by 2pm tomorrow (Friday). All athletes must be registered for 2018 to be allowed to take part in this event. No entries will be accepted on competition day. See Provisional Start Lists here for Munster Junior & U/23 & Walks Indoor Championships. Any errors or ommissions to be notified to indoorsecretary@munsterathletics.com by 6pm tomorrow (Friday). All athletes must be registered for 2018 to be allowed to take part in this event. No entries will be accepted on competition day. To complete entries for the Munster Senior & Master Indoor Championships, please use this link https://sso.primoevents.com/sso and enter your new Club login details to proceed. Clubs are still having problems with the AAI online registration and entry system. If you still have entries to do, please e-mail Mossie Woulfe (mossiewoulfe1@gmail.com) with the Juvenile/Youth Pentathlon entries and Padraig Kelly (indoorsecretary@munsterathletics.com) for Junior, U/23 & Walks entries. All entries to be in by 6pm on Friday (5th). Thank you for your patience. AAI Online Registration and Entry System for 2018 - Please note that there are still problems logging into this system. AAI and Primo Solutions are working on the issues but the resolution date is unknown. If the system is not operating by the 27th December, alternative entry methods will be put in place by Munster Athletics and notified to all Clubs by e-mail. Day 3 of the Munster Development & Performance Squads takes place on Saturday 30th December in Nenagh Indoor Stadium. Development Squad takes place from 11am to 1pm and is open to all athletes aged 12 years+. The squad will cost 5 euro per athlete. Please check in at the venue from 10.30am. 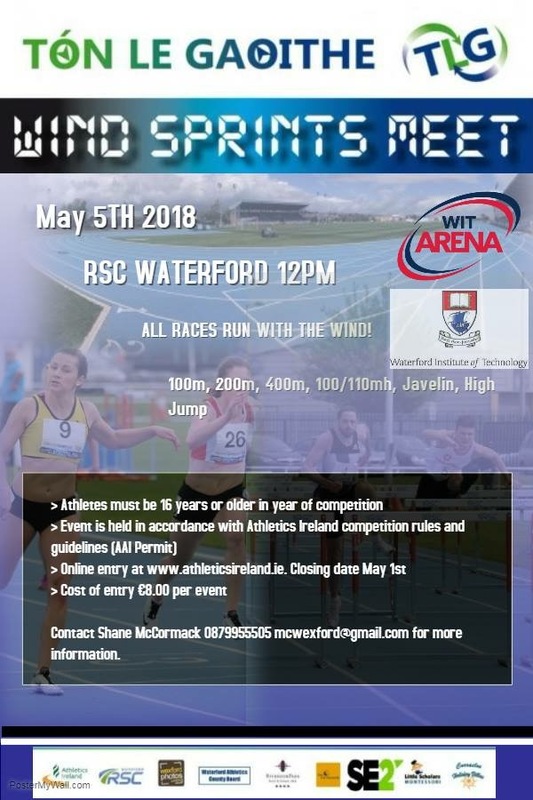 Events covered on the day will be SPRINTS (Kevin Cogley), SHOT PUTT (Dave Fratarolli), LONG JUMP (Pat Power), POLE VAULT (Eamon Flanagan) & MIDDLE DISTANCE (Sean Finn). The Performance Squad takes place from 1pm to 3pm and is for selected athletes only. All Discus, Javelin and Hammer throwers should go directly to Borrisokane A.C. Grounds. The Walks Development Squad will take place from 1pm to 3pm with the Walks Performance Squad. Congratulations to all our Munster Star Award Winners for 2017. See List here. The Munster Star Awards Banquet will take place on Saturday 3rd March 2018 in the Auburn Lodge, Ennis, Co. Clare. Can all award winners please check their name spellings and if any amendments are required, please e-mail info@tipperaryathletics.com. The Night Run is back for 2018. See all the details here. Irish Life Health National Juvenile Uneven Age & Novice XC Championships - See AAI Review & Results here. See important AAI Registration Info for 2018 here. 2017 registration system is now closed. 2018 registration system will open on Monday 18th December. Novice and U/23 set for customary cavalry charge. See AAI Preview, timetable, course map and start lists here. Good luck to all our Munster athletes who will be competing. ONLINE ENTRY IS NOW OPEN for the forthcoming Munster Indoor season. Closing date for Munster Juvenile/Junior Pentathlons and the Junior & U/23 Indoor Championships is midnight on Wednesday 3rd January. Closing date for Munster Senior & Masters Indoor Championships is midnight on Tuesday 9th January. All details can be found on our "Forms" page here. Munster Juvenile Indoor Competition Booklet 2018 - see here. AAI Clubs Safety Statement 2017 - See here. Senior Men Head Good Irish Performances at Euro Cross Country - Congrats to our athletes - Senior Men's race - Sean Tobin, Clonmel A.C. 15th, Kevin Maunsell, Clonmel A.C. 24th; Senior Women - Shona Heaslip, An Riocht A.C. 33rd, Michelle Finn, Leevale A.C. 40th, Lizzie Lee, Leevale A.C. 49th; U/20 Women - Stephanie Cotter, West Muskerry A.C. 27th, Laura Nicholson, Bandon A.C. 39th, Fiona Everard, Bandon A.C. 62nd; U/20 Men - Fearghal Curtin, Youghal A.C. 22nd, Darragh McElhinney, Bantry A.C. 39th & Charlie O'Donovan, Leevale A.C. 41st. See AAI Review here. Wins for Alex Wright, Leevale A.C. (20km) Gearoid McMahon, Shannon A.C.(5km) and David Kenny, Farranfore Maine Valley A.C. (10km) with silver for Kate Veale, West Waterford A.C. at Irish Life Health National 20km Walks Championships in St. Anne's Park, Raheny on Saturday 9th December. See AAI review and results here. Exceptional Quality Finish to Autumn Season for National Throws Squad. See more here. Team Selection for Celtic Cross Country International. Congrats to all the Munster athletes selected (Girls U/17 - Aimee Hayde, Newport A.C. & Lucy O'Keefe, Youghal A.C.; Boys U/17 - Tommy Connolly, Leevale A.C.; U/20 Women - Laura Nicholson, Bandon A.C., Stephanie Cotter, West Muskerry A.C. & Shauna Doellken, Kenmare & District A.C.; U/20 Men - Charlie O'Donovan, Leevale A.C. & Darragh McElhinney, Bantry A.C.; U/23 Women - Fiona Everard, Bandon A.C.; Senior Men - Kevin Maunsell, Clonmel A.C.; Senior Women - Laura Crowe, An Riocht A.C.; U/17 Girls Dev - Laura Healy, Ennis Track A.C.; U/17 Men Dev - Paul Hartnett, Midleton A.C., Mark Hanrahan, Ennis Track A.C., Matteo Mary, Waterford A.C., U/20 Women Dev - Aisling Kelly, St. John's A.C. & Laura Hayes, St. Catherine's A.C.; . See more here. McDaid to Lead Senior Women's Team Ahead of New Role - See more here. The Munster Star Awards Banquet will take place in Ennis, Co. Clare on Saturday 3rd March 2018. Star Award Recipients will be announced before Christmas and all information regarding the awards will be sent to the Clubs after Christmas. Congrats to Rob Heffernan, Togher A.C. who was named "Athlete of the Year", "Endurance Athlete of the Year" and a member of the "Team of the Year", the Irish Men's European Race Walking Team at the Irish Life Health Irish Athletics Awards in the Crowne Plaza Hotel, Santry on Wednesday 6th December. Other Munster winners were Drew & Hayley Harrison (Service to Coaching), Phil Healy (University Athlete), Donie Walsh (European Athletics Award) & Nenagh Olympic A.C. (Development Club). See AAI review here. AAI Registration figures for end of November 2017 - See here. Irish mixed relay team selected for Great Edinburgh XC. Congrats to Laura Crowe, An Riocht A.C. who has been selected - See more here. The Little Book of Irish Athletics by Tom Hunt - Book launch on Friday 8th December at 6.30pm in the Book Centre, Waterford. All are welcome. See the details here. Munster Juvenile "B", Junior & Intermediate Cross Country Championships. See updates results here. 11 Munster athletes named on Irish team for European Cross Country Championships. See more here. Congrats to Laura Nicholason, Bandon A.C., Stephanie Cotter, West Muskerry A.C., Fiona Everard, Bandon A.C., Charlie O'Donovan, Leevale A.C., Fearghal Curtin, Youghal A.C., Darragh McElhinney, Bantry A.C. (U/20), Shona Heaslip, An Riocht A.C, Lizzie Lee & Michelle Finn, Leevale A.C., Sean Tobin & Kevin Maunsell, Clonmel A.C.
Job Opportunity - CEO Athletics Ireland. See details here. Munster Junior & U/23 Indoor Championships and Munster Senior & Masters Indoor Championships 2018. See Cover letter here with all information on these Championships. Timetables here: Munster Junior & U/23 & Juvenile Pentathlons Munster Senior & Masters Indoor Championships. Online entry will go live shortly. Further details will be available in the next few days. There may be further changes to the Juvenile Pentathlon Timetable. Heaslip heads great day in Abbotstown. See AAI Review and results here. Congrats to Shona Heaslip, An Riocht A.C. who won the Senior Women's race with Michelle Finn & Lizzie Lee 3rd & 4th. There was wins for Leevale A.C. and Cork in the team competition & bronze for An Riocht A.C. Best Munster finishers in Men's race was 5th place for Kevin Maunsell, Clonmel A.C. and 6th for Mark Hanrahan, Leevale A.C. with Cork winning 3rd in the Inter-County competition. In the Juvenile races, there was top 3 finishes for Ava Fitzgerald, Carraig na BhFear A.C. (3rd GU12), Aimee Hayde, Newport A.C. (1st GU16), Laura Nicholson, Bandon A.C. (1st GU18/Junior), Stephanie Cotter, West Muskerry A.C. (2nd GU18/Junior), Ben Walsh, Nenagh Olympic A.C. (3rd BU12) & Charlie O'Donovan, Leevale A.C. (3rd BU18/Junior). Irish Life Health National Juvenile Even Age & Senior Cross Country Championships, Sunday 26th November in the National Sports Campus, Abbotstown. See Timetable, Course Map, Parking details/directions and Start Lists here. See AAI Preview here. Athletics Ireland numbers reach 60,000+. See AAI report here. There will be no Performance Squad Shot Putt on Saturday as Dave Fratarolli is unavailable. However, an extra session will be put on at a later date to cover this. All Javelin, Discus and Hammer throwers should go straight out to Borrisokane A.C. Athletics Grounds. There is no need to check in at the stadium beforehand. THIS INCLUDES ANY ATHLETES WHO WISH TO DO THE JAVELIN DEVELOPMENT SESSION. Development session will run from 11am to 1pm in Borrisokane. If unsure of the directions, please give John O'Farrell a call on 087 2210115. DEVELOPMENT Events for Saturday are Short Hurdles with Noelle Morrissey, High Jump with Martin O'Grady, Javelin with Brian Scanlon and Middle Distance with Sean Finn. We have excellent coaches so please encourage your athletes (12 years+) to attend as these sessions will be very beneficial to them. Session is from 11am to 1pm and fee is 5 euro per athlete. The Middle Distance session for Development athletes will take place in Nenagh CBS grounds but please come to the stadium first to register and meet as a group. Frank Lynch, our Walks Coach will take Development Walkers with his Performance Squad from 1pm to 3pm in Nenagh Indoor Stadium. At the end of the Performance Session, Karen Coughlan and Caroline O' Connell, Physiotherapists from Cahir Physiotherapy will do a short sesson on prehad/conditioning. Can all athletes please bring a mat and a mini-band/theraband with them on the day. Day 2 of the Munster Development & Performance Squads takes place on Saturday 25th November in Nenagh Indoor Stadium. Development Squad takes place from 11am to 1pm and is open to all athletes aged 12 years+. The squad will cost 5 euro per athlete. Please check in at the venue from 10.30am. Events covered on the day will be SHORT HURDLES (Noelle Morrissey), JAVELIN (Brian Scanlon), HIGH JUMP (Martin O'Grady) & MIDDLE DISTANCE (Sean Finn). The Performance Squad takes place from 1pm to 3pm and is for selected athletes only. If any selected athletes did not register yet, they can do so on 25th November. Karen Coughlan & Caroline O'Connell, Physiotherapists with Cahir Physiotherapy will give a practical session on Prehab/Conditioning at the end of the Performance squad. US NCAA D1 & D2 Cross Country Championships report. See here. Our thanks to Brother John Dooley for the report. Munster Juvenile Inter-Club Relay Championships. See results here. Successful Limerick and Kerry Jumps Workshops held. See AAI report here. Trail World and Long Distance Mountain Running Championships 2018. See selection criteria and other details here. See NCAA Regional Cross Country Results here. Our thanks to Brother John Dooley for this week's report. Sean Tobin, Ole Miss/Clonmel A.C. has qualified with Ole Miss team for NCAA XC Championships on 18th November in Louisville, KY. Keep up to date with all NCAA news and results at www.letsrun.com. Munster Masters Cross Country Championships & Juvenile Inter-Club Cross Country Relay Championships, Sunday 19th November in the Cork Athletics Grounds, Slieveroe, Riverstick. See directions, GP co-ordinates, course map and parking details here. First race commences at 11.30am. Lost & Found: A sum of money was found in Galbally at the Munster Cross Country Championships. Owner should get in touch at info@munsterathletics.com. See Results here for Munster Juvenile Uneven Age & Senior Cross Country Championships. Irish Team Flower in Scotland. See AAI Review on SIAB International here. Well done to Munster athletes Orla Coffey, St. Angela's Cork/Carraig na BhFear A.C., Aisling Cassidy, Bandon Grammer/Leevale A.C., Brian Lynch, Colaiste an Spioraid Naoimh/Old Abbey A.C. & Darragh Miniter, Ennistymon CBS/St. Mary's A.C. Clare who all represented Ireland on the day. Heaslip Top Irish Performer in Belguim. See AAI Report here. Munster Juvenile Uneven Age & Senior Cross Country Championships - See Start Lists here. First race, Girls U/9 commences at 11.30am. Please ensure you leave plenty of time to get to the venue. Munster Juvenile Inter-Club Relay and Masters Cross Country Championships, Sunday 19th November in Riverstick, Co. Cork. Closing date for receipt of entries is midnight on Monday 13th November. See details about Juvenile Inter-Club relays on page 13 of Munster Juvenile XC Booklet here. Schools Cross Country dates: East Munster Schools Cross Country Championships, Thursday 8th February 2018, Munster Schools Cross Country Championships, Friday 23rd February, Irish Schools Cross Country Championships, Saturday 10th March. Venue for all 3 competitions is WIT Sports Campus, Carriganore, Waterford. IMPORTANT INFORMATION: Munster Juvenile Uneven Age & Senior Cross Country Championships - See Directions to the venue in Galbally here. See Course Maps here. Numbers can be collected at the venue near the finish line (as marked on map). Traffic stewards will be present in Galbally village during the day to direct traffic & notify everyone of parking options. Buses will be able to park in the rugby pitch. Mooreabbey Milers A.C. request that all competitors and spectators follow the directions of the stewards on duty. First race (Girls U/9) starts at 11.30am. There are over 200 athletes in some of the younger age groups so please ensure that you leave plenty of time to get to the venue. See latest report for Irish athletes based in US here. Our thanks to Brother John Dooley for the report which covers 3rd, 4th & 5th November 2017. See more about Irish athletes in the US here. AAI registration figures for end October 2017. See here. Munster Convention will take place in a Tipperary venue (tbc) on Saturday 3rd February 2018 at 12 noon. All nominations and motions to Esther Fitzpatrick, Munster Administration Secretary by Sunday 28th January 2018. Update on Munster Squads: Walks Coach, Frank Lynch will take development athletes (12+ years) with his Performance group from 1pm to 3pm. Anyone who is interested should just turn up on the day and register before 1pm, cost is 5 euro. Both Discus and Hammer Performance Squads will be covered by John O'Farrell on the day, all athletes for both events should go straight to Borrisokane A.C. grounds in Borrioskane. All the rest of the groups should come to Nenagh Indoor Stadium. Guest speaker on the day will be Brother John Dooley, AAI Liaison Officer for Irish athletes based in the US. Report on US Based Irish athletes for 26th to 30th October - See here. Graham defends title in delightful day in Dublin. See AAI review of Dublin marathon here. Euro Qualifier for Graham. See more here. Athletics Ireland Safeguarding Statement. See more here. Shot Putt Workshop in Templemore Track on Thursday 2nd November at 10am. See details here. European Selection Opportunity at Dublin Marathon. See more here. National Glory up for grabs at Dublin Marathon. See Entry List and Live Stream Links here. Sprints & Jumps Network Day Initiative 2017. Read AAI Report here. Nenagh Olympic A.C. Fundraising Appeal. The Club has just launched a fundraising site to raise 90,000 euro to cover the shortfall in the cost of restoring the Indoor Stadium to competition level following their recent fire damage. The Indoor stadium is a very valuable resource to athletics in Munster so if anyone or any Club is in a position to help them with their appeal, it would be greatly appreciated. Link to donate can be found here. Read more here. 4 Open Indoor Meetings coming up in the National Indoor Arena in Abbotstown, Dublin. See link here for all the details. First meet is Thursday November 9th. Hammer Coaching Workshop in Templemore re-scheduled to Thursday 2nd November. See details here. Reminder re. registration for Munster Performance Squad. All athletes should register by Thursday 2nd November. Cost is 25 euro per athlete which includes the 4 sessions and a squad T-Shirt. Registration link can be found here. More information here. Latest results for Irish based athletes in the US. See here for results from 29th & 30th September & 1st October. Our thanks to Brother John Dooley for the report. Shona Heaslip, An Riocht A.C. puts best foot forward to win Autumn Open Cross Country. See AAI Review here. See Provisional results here from Munster Juvenile Even Age, Novice & U/23 Cross Country Championships. Any errors/omissions, please contact ccsecretary@munsterathletics.com. Where are they now? Ireland's "lost" Scholarship Athletes. See excellent article with Brother John Dooley, Liaison Officer to Irish athletes in the US here. Read more about Irish athletes based in the US here. Ray Flynn to be inducted into Athletics Ireland Hall of Fame. See more here. Applications for 2018 Carding now open. Closing date is Sunday 29th October 2017. See all the details here. See Start Lists here for Munster Juvenile Even Age, Novice & U/23 Championships for this Sunday 22nd October in Clarecastle, Co. Clare. See Course Map here. The event is going ahead as planned, if any changes are necessary due to weather conditions, they will be posted here and sent around to all Clubs. Munster Juvenile Even Age, Novice & U/23 XC Championships - Everyone travelling to Clarecastle on Sunday should exit the motorway at Junction 12, then turn left at the 2nd roundabout into Clarecastle village. Numbers will be available at the GAA Clubhouse. All Buses should park in Clarecastle National School grounds. 2017 European Athletics Congress Convention. See report from AAI here. Tipperary Athletics are holding a Hammer Workshop which will be given by Phil Conway on Wednesday 1st November in Templemore Track from 10am to 2.30pm. See all the details here. Extension of Online Entry Deadline: Munster Juvenile Even Age, Novice & U/23 Cross Country Championships online entry deadline has been extended to midnight on Wednesday 18th (tomorrow). The Irish Life Health National Athletics Awards 2017. Wednesday 6th December at 12 noon in the Crowne Plaza Hotel, Santry - See all the details here. Munster Development & Performance Squads. See all the information here. All selected Performance athletes are asked to register online by Thursday November 2nd. See more details including list of coaches for both squads and selected athletes for the Performance Squads here. The same coaches will take both the Development and Performance Squads so can all Clubs please encourage their non-selected/younger athletes to attend the Development Squads. They are open to all athletes aged 12+ and will run from 11am to 1pm on each day at a cost of 5 euro per athlete. On Day 1 and Day 3, the events will be Sprints, Shot, Long Jump, Pole Vault & Middle Distance and Day 2 and Day 4 will cover Short Hurdles, Javelin, High Jump & Middle Distance. The Performance Squads will cover all events. Application for re-grading for the 2017/18 Cross Country Season. See more here. Taoiseach Launches CX+ Sport's Partnership with Athletics Ireland. Read more here. National Marathon Team Declaration Form. Deadline is Friday 20th October. See here. Munster Cross Country online entry is now open. See all the details here. Munster Cross Country Rulebook here. First date is Sunday 22nd October for Munster Juvenile Even Age, Novice & U/23 XC Championships in Clarecastle, Co. Clare. Closing date for online entry is midnight on Monday 16th October. Sprints & Jumps Network Day, Saturday 30th September in AIT. See details here. 5th Endurance Coaching Network Meeting is being held in Athlone I.T. on 30th September. See all the details here. Successful Athletics Ireland Junior XC Camp held. See more here. 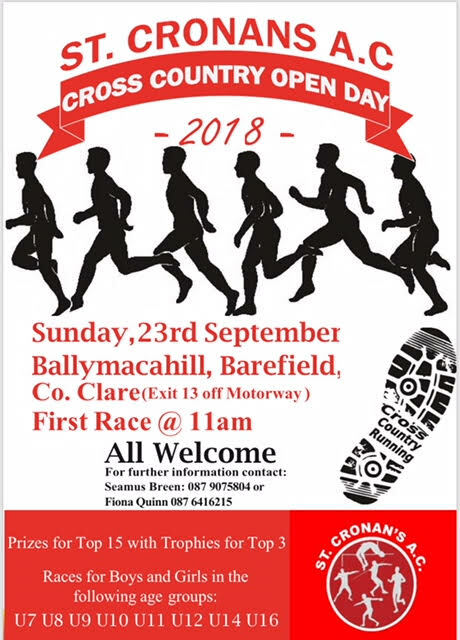 St. Cronan's A.C. Open Cross Country Day, Sunday 17th September @ 11am in Ballymacahill, Barefield, Co. Clare. See details here. St. Senan's A.C. 40th Annual Open Cross Country, Sunday 24th September @ 1pm at Kilmacow Community Centre. See all the information here. To celebrate their 40th year in running this event, St. Senan's A.C. would like to get 40 teams in the Senior races - something to celebration our Irish tradition of Cross Country and they would greatly appreciate if Clubs could support their idea. MemTrain Erasmus+ - volunteers aged 55+ required by AAI. See all the details here. Coaches Workshop on annual reviews and performance plans - See all the details here. Coaching Courses in the South West for Sept & October - See details here. An Riocht A.C. in Castleisland, Co, Kerry are holding a Graded Track & Field Athletics Event on Saturday 2nd September at 12 noon. Electronic timing will be available, events covered 100m, 200m, 400m, 3km, Shot & Long Jump for Women & Men. Minimum age is 16 in 2017. See more information on FB here. Entry link can be found here. National League Final - See AAI Review and Results here. National Community Games Athletics Finals. See all the details here. MESSAGE FROM NATIONAL COMMUNITY GAMES RE: ATHLETICS. All Athletics events will take place on a Grass Track in Abbotstown with the exception of the High Jump and Long Jump which will take place in the Indoor Arena. Please Note for Long Jump & High Jump spikes must not be longer than 5mm. All other field events will take place on grass. National League Final, Sunday 20th August in Tullamore. See Timetable here. Heffernan Crowns Great Career with Top 8 Finish in London. See AAI Review here. National League Final Qualifying Teams. See here. Barr Forced to Withdraw due to Illness. See AAI Report here. Barr Clears First Hurdle on Marathon Day. See AAI Review here. Thomas Barr, Ferrybank A.C. through to SF of 400mH finishing 4th in heat in 49.79, Mick Clohisy, Raheny Shamrocks A.C. 22nd in Marathon & Claire McCarthy, Leevale A.C. 33rd in Marathon. Celtic Games 2017 - See AAI Review and Results here. Munster PRO Report here. Irish Team Set for World Championships. See Irish Athlete Details and Irish Timetable here. European Master Athletics Championships 2017. See Results and news here. Athletics Ireland AGM Minutes April 2017. See here. Tralee Harriers A.C. Annual 10km Road Race as part of the The Rose of Tralee Festival. Sunday 20th August 2017. Register here. National League Round 2 - See Results here. European Youth Olympic Festival Roundup - See AAI Review here. Congrats to Noelle Lenihan, North Cork A.C. who won a fantastic silver medal in the F38 Discus with a throw of 32.12m CR at the 2017 Para Athletics World Championships in London on Thursday 20th July. See Results here. Munster Juvenile "B" Track & Field Championships, Saturday 29th July in Templemore. See Results here.